What happened in the first year of King Darius the Mede? Those who hope to ever understand the meaning of Dan 9:24-27 will need to have at least a rudimentary knowledge of these things. God didn’t include them in order to titillate history buffs; rather everything that is written in the Scriptures was written as examples and warnings on whom the fulfillment of the ages has come (1Cor 10:11). Just remember what Jesus said! He was speaking of a time in the future – a time when His Kingdom would be established and everything that would occur at that time: Luke 21:22 "For this is the time of punishment in fulfillment of all that is written." He spoke of the time prophesied by Jacob concerning Ephraim about the times of the Gentiles. All that is holding back the tide of Gentiles is the mighty power of Ephraim. But when God withdraws his protection (2Thess 2:7), nothing will stop this tide. And of course, the Gentiles will achieve their ambition of seizing God’s Holy City – not because they see any value in Jerusalem, but because Satan has a fixation about controlling the City of God, and the Gentiles are drunk on the wine of his deception! And the fulfillment of all these things? Jesus spoke of it: V24 "They will fall by the sword and will be taken as prisoners to all nations. Jerusalem will be trampled on by Gentiles until the times of the Gentiles are fulfilled." For over 1900 years no-one has understood the Scriptures with clarity. In fact, for 1300 years the Scriptures were locked away in monasteries, and written in a language that few understood. The only references to Scripture that the people heard were cute little stories by monks, priests and nuns. In the 14th century, translations began to be printed and published to make the Bible accessible to the people, but the Catholic Church endeavoured to purchase them all and burn them. But their money actually funded bigger print runs, and became unstoppable. After a flurry of excommunications they could do nothing. Long ago, the Gentiles seized control of the canonization of the New Testament and decided for themselves what would be included. Anything that didn’t favour them was altered or doctored. There are some obvious gaps in Romans chapter 11 that Paul would not have left out, but they are not there today. The Gentiles also had a field day with the book of Galatians – some of which borders on blasphemy! But there was little they could do with the Scriptures that Christ used because the keepers of the Scriptures had already preserved these for more than a thousand years. But the Gentiles did manage to insert some spurious books into their canon, and they are still there today in Catholic versions, though most modern versions have dumped them. The one Book that came out virtually unscathed in the New Testament is the Book of Revelation. So where does all this leave us? Is the Truth now in doubt? Not at all! The Scriptures that Christ used are virtually intact (though there are some very obvious transcribed errors), and this is the core of all Scripture. Anything that doesn’t measure up to them is false. God never authorized anyone to build doctrine on a single word or even a single verse. His instructions are as follows: Isa 28:9 "Who is it He is trying to teach? To whom is He explaining His message?" Who indeed! God tells us in V1 – it’s Ephraim! "To children weaned from their milk, to those just taken from the breast?" (A reference to Jer 31:19, and with some explanation, also to Hos 11:1-3 and 12:12-14). "For it is: Do and do, do and do, rule on rule, rule on rule, a little here, a little there." The NKJV makes this a little clearer: "For precept must be upon precept, precept upon precept, line upon line, line upon line, here a little, there a little." And in the NIV: V11 "Very well then, with foreign lips and strange tongues (Gentiles) God will speak to this people to whom He said "This is the [Rest] (the Sabbath Rest – Heb 4:1-7), let the weary rest; and this is the [real Rest] – but they would not listen." So what does ‘foreign lips and a strange tongue’ mean? Are the Gentiles now the keeper of God’s Word? Not at all, in fact, never! But since they didn’t want to listen to God – now they will listen to Gentiles! V13 "So then the Word of the LORD will become: Do and do, do and do, rule upon rule, rule upon rule; a little here, a little there – so that they will go and fall backwards, be injured and snared and CAPTURED." Yes, God is speaking of CAPTIVITY! God is warning them that He is trying to teach them by explaining His message through the messenger, but they refuse to listen! So now they will serve Gentiles! And God’s Word continues: V14 "Therefore hear the Word of the LORD, you scoffers who rule [over] this people in Jerusalem." Ephraim bullies the people of Jerusalem into accepting terrorism on a daily basis; they react with fury when the same outrages are leveled at them but expect the Israelis to make peace with terrorists! Why didn’t Ephraim make peace with Saddam Hussein and Osama bin Laden? But they fully expect the Israelis to make peace with murdering Palestinians. God hates this type of hypocritical falsehood! No, they say, the Iraqis and the Afghans are not their enemies, but only the leaders. Funny they should say this! Because both these peoples hate their guts and have vowed to destroy them! As for the leaders – they have yet to fight them or even find them! So we begin to see what is troubling God in regard to Ephraim! But God adds more: V15 "You boast, "We have entered into a covenant with Death, and with the Grave we have made an agreement. When an overwhelming scourge sweeps by, it cannot touch us, for we have made a lie our refuge and falsehood our hiding-place." Silly, foolish Ephraim! How they love to make agreements and covenants with God’s enemies! 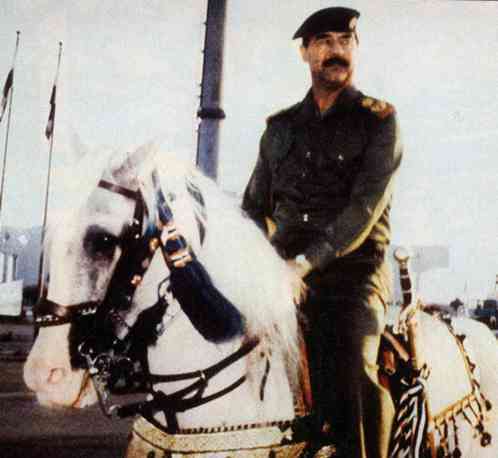 Saddam Hussein on his white horse. He may not be parading for the world at the moment, but neither is he lying in his grave! Jesus said the City of Jerusalem will be trampled underfoot until the times of the Gentiles is fulfilled. Well, guess what! God says the same thing about the City of Washington – Ephraim’s city! And it’s in the same chapter of Isaiah: Isa 28:1 "Woe to that wreath, the pride of Ephraim’s drunkards, to that fading flower, his glorious beauty, set on the head of a fertile valley – TO THAT CITY, the pride of those laid low by wine!" The wine of Satan and his agents: Death and Grave! V2 "See, the LORD has one who is powerful and strong. Like a hailstorm and a destructive wind, like a driving rain and a flooding downpour, he will throw it forcefully to the ground. That wreath (that CITY), the pride of Ephraim’s drunkards, WILL BE TRAMPLED UNDERFOOT. That fading flower, his glorious beauty, set on the head of a fertile valley, will be like a fig ripe before the harvest – as soon as someone sees it and takes it in his hand, he swallows it." And just to follow on from V15: Isa 28:16 "So this is what the Sovereign LORD says: "See I lay a stone in Zion, a tested stone, a precious cornerstone for a sure foundation; the one who trusts will never be dismayed. I will make justice the measuring-line and righteousness the plumb-line; hail will sweep away your [Ephraim’s] refuge, the lie, and water will overflow your hiding place. Your covenant with Death will be annulled; your agreement with the Grave will not stand. When the overwhelming scourge sweeps by, you will be beaten down by it. As often as it comes it will carry you away; morning after morning, by day and by night, it will sweep through. The understanding of this message will bring sheer terror." Of course, there is a good chance that most won’t understand it until it happens (Matt 24:38-39). Ephraim considers their city to be more important than God’s City. If they had sought God’s favour, they would have wiped out the Palestinians and driven the Moslem scourge from the Holy Land – from the River of Egypt to the River Euphrates! But they chose to enter into agreements and covenants with all these people, and to give away God’s Land! God plans to violently throw Ephraim to the ground and bring a scourge through the land. These Gentiles will trample on their City and their people, and God will then deal with the remnant that remain: V5 "In that day the LORD Almighty will be a glorious crown, a beautiful wreath for the remnant of His people. He will be a Spirit of Justice to him who sits in judgment, a source of strength to those who turn back the battle at the gate." Paul spoke of only a remnant being spared (Rom 9:27). God will launch a rescue bid, and through His strength, the battle will be turned back at the gate. And who’s responsible for the madness that presently prevails in Ephraim? Who’s behind the faulty reasoning and lack of justice? Justice? Have you noticed the madness of those who are trying to convict a man over the anthrax attacks? The childish writing on the letters, and the reference to ‘Allah is great’ is a clear sign that it’s Islamic in origins. But some lunatic woman in the Justice Department has convinced everyone that it’s Dr. David Hadfield. And their overwhelming evidence against this man? Zilch! Nothing! Not a shred of evidence! This whole lunatic campaign is designed to whitewash Islam! The FBI trashed the homes of Hadfield and his girlfriend, seized all his computer gear and disks, and probed into every area of his life. Oddly enough, they wouldn’t access the laptop of Zecharias Moussauoi the Moslem, now in custody, who was actively involved and implicated in the 9-11 attacks on the World Trade Center and the Pentagon! They felt that looking into his laptop might violate his human rights! Justice in America is turning into looney-toons. 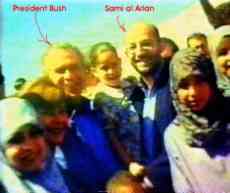 Sami al Arian on right. This time he’s got the bracelets on. 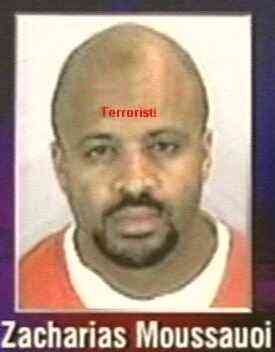 He’s been arrested for terrorist activities. Let’s hope the Moslem scumbag rots in Jail. As a Moslem, this terrorist has more rights than an American! They refused to examine the contents of his laptop for fear of violating his human rights! So what did happen in the first year of Darius? This was the time when the Jewish people hoped that God would bring an end to transgression and sin, to bring in everlasting righteousness, to seal up vision and prophecy and to anoint the Holy Place (Dan 9:24) following the seventy long years that Jeremiah spoke about. The answer that Daniel received was cryptic, and perhaps not what he hoped for, but it was the answer God gave to his request. And the answer came in the first year of Darius the Mede (V1). We shouldn’t be surprised that the answer given was cryptic! Most of the Bible, in relation to prophecy is cryptic. If you think you can read the ‘pure word’ of the Bible, as some put it, and just understand it as it is written, then you would never understand much! For instance, you wouldn’t even understand the meaning of what Christ taught. He spoke in parables so that no-one, except His disciples, could understand. And even these had to have it explained to them afterwards. And Jesus gave his reasons: Matt 13:11 "The disciples came to Him and asked, "Why do you speak in parables?" He replied, "The KNOWLEDGE OF THE SECRETS of the Kingdom of heaven [God] has been given to you, but not to them. Whoever has will be given more, and he will have abundance. Whoever does not have, even what he has will be taken from him. This is why I speak in parables: "Though seeing, they do not see; though hearing, they do not hear or understand. In them is fulfilled the prophecy of Isaiah: "You will be ever hearing but never understanding; you will be ever seeing, but never perceiving. For this people’s heart has become calloused; they hardly hear with their ears, and they have closed their eyes. Otherwise they might see with their eyes, hear with their ears, understand with their hearts and turn, and I would heal them." This is the way it’s been throughout history! No-one understood the KNOWLEDGE OF THE SECRETS of God’s Kingdom, even though many thought they did, but it was only revealed to God’s servants the prophets. These were always the ultimate teachers who spoke on God’s behalf. It was these through whom God issued the ultimatums and warnings before disaster struck. Today, people read the parables as if they were just cute little stories to make the meaning clearer – yet Jesus said the exact opposite! Those who like to cozy up to the ‘pure word’ – as they put it – never seem to understand or see anything Jesus taught, or why He spoke in this cryptic manner! Too many people today think that Jesus told weak little stories to feeble-minded listeners. Instead He advised that He was revealing the KNOWLEDGE OF THE SECRETS OF THE KINGDOM OF GOD! For all these many centuries, people have been telling weak, little stories to enhance their doctrine, and to turn people into sniveling cowards. If you think that Jesus was weak, then you have never known Jesus! God hates weak, insipid people who lack any backbone. Such people seem to forget that one of the last acts concerning the Apostles was to advise them to buy swords (Luke 22:36-37). And after the unruly mob arrived to arrest Jesus – and after they all fell over backwards when He spoke to them – Peter stepped up and sliced off Malchus’ ear (V50). He ordered them to buy swords so that He would be seen to be ‘numbered with transgressors’. This was to fulfill what was spoken of Him in Isa 53:12 "Therefore I will give him a portion with the great, and He will divide the spoils [of war] with the strong (see Zech 14:3, 14), because He poured out His life unto death, and was numbered with transgressors." And who’s the strong here? It’s Judah! The Jewish people! They are going to be very strong and fight alongside the Mighty Christ. They’ll be given some good examples to follow by the Sons of Jerusalem when they go out to fight the horses and riders of the Gentiles (Zech 12:4-6) – the four horsemen of the Apocalypse! This is when the campaign will begin to clear the Holy Land from the River of Egypt to the River Euphrates. Isa 4:2 "In that day the Branch of the LORD will be beautiful and glorious, and the fruit of the land will be the pride and glory of the survivors in Israel. Those who are left in Zion, who remain in Jerusalem, will be called holy; all who are recorded (a reference to Mal 3:16) among the living in Jerusalem. The Lord will wash away the filth of the women of Zion (a reference to Zech 14:2 - ‘raped’); He will cleanse the bloodstains from Jerusalem by a Spirit of judgment and a Spirit of fire. Then the LORD will create over all of Mount Zion and over those who assemble there a cloud of smoke by day and a glow of flaming fire by night; over all the glory will be a canopy [should be: the Glory will be a canopy over all]." While all these things may seem strange to some people, the reality is even stranger! God says this in the continuation of Isa 28:21-22 "The LORD will rise up as He did at Mount Perazim, He will rouse Himself in the Valley of Gibeon – to do His work, His strange work, and perform His task, His alien task. Now stop your mocking, or your chains will become heavier; the Lord, the LORD Almighty, has told me of the destruction decreed against the whole land." Establishing the Holy Land will take some time, in fact, some years. But it’s going to take even longer to either kill or transport 250 million Ephraimites away as slaves. But God has been generous enough with His timetable to ensure that all prophecy is fulfilled. Initially, there will be years of bloodshed and terror in the streets and this will come like wave after wave – an overwhelming scourge! But through the fog of despair, the whole House of Israel will know that God has prepared His rescue bid – His salvation – from the hands of their enemies. Now is the time to stop mocking God’s intentions and start believing Him! Those who don’t, and all those who stand against God, will become an example for all others, and He intends to make their chains very heavy indeed! The first thing that Joshua, Zerubbabel and their associates did, was to built the Altar of God (Ezra 3:2), and on the Feast of Trumpets (the 1st Day of the 7th month) (V6) they began to offer the morning and evening sacrifices (V4) and they celebrated the Feast of Tabernacles with the required number of burnt offerings prescribed for each day (same verses). The foundation of the Temple had, at this point, not been laid (V6). Have you ever noticed how specifically the dynasty of Darius is referred to, with such precise dates? The prophets didn’t speak of dates from the time of the destruction of the Temple, or even in relation to the seventy years spoken of by Jeremiah, but almost exclusively in relation to the years of Darius’ reign. 1st year of Darius: (Dan 9:2). I, Daniel, understood from the Scriptures according to the Word of the LORD given to Jeremiah the prophet, that the desolation of Jerusalem would last seventy years. This Darius was a Mede by descent. 1st year of Darius the Mede: Gabriel took his stand to support and protect Darius (Dan 11:1). It was Darius the Mede that Gabriel protected. 1st year of Cyrus, king of Persia: 2Chron 36:20 "[Nebuchadnezzer had] carried into exile to Babylon the remnant who escaped from the sword, and they became servants to him and his sons until the kingdom of Persia came to power. The land enjoyed its Sabbath rests; all the time of its desolation it rested, until the 70 years were completed in fulfillment of the Word of the LORD spoken by Jeremiah. In the first year of Cyrus king of Persia, in order to fulfill the Word of the LORD spoken by Jeremiah, the LORD moved the heart of Cyrus king of Persia to make a proclamation throughout his realm and to put it in writing: This is what Cyrus king of Persia says: ‘The LORD, the God of heaven, has given me all the kingdoms of the earth and has appointed me to build a Temple for Him at Jerusalem in Judah. Anyone of His people among you – may the LORD his God be with him, and let him go up." This was after it was pointed out to the king of Persia that the Scriptures had spoken of him about 200 years before or 140 years before the Temple was demolished in 586 BC. Cyrus read the reference in the Book of Isaiah. Josephus records the account in ‘The Antiquities of the Jews’, Bk 11, chapt. 1:1. Isa 44:28 "[I am the LORD] who says of Cyrus, ‘He is my shepherd and will accomplish all that I please; he will say of Jerusalem, "Let it be rebuilt," and of the Temple, "Let its foundations be laid." Next verse in Isa 45:1 "This is what the LORD says to His ANOINTED, to Cyrus, whose right hand I take hold of to subdue nations before him so that gates will not be shut: ‘I will go before you and will level the mountains; I will break down gates of bronze and cut through bars of iron. I will give you the treasures of darkness, riches stored in secret places, so that you may know that I am the LORD, the God of Israel, who calls you by name. For the sake of Jacob my servant, of Israel my chosen, I call you by name and bestow on you a title of honour, though you do not acknowledge me. I am the LORD, and there is no other; apart from me there is no God. I will strengthen you, though you have not acknowledged me, so that from the rising of the sun to the place of its setting men may know that there is none besides me. I am the LORD, and there is no other. I form the light and create darkness, I bring prosperity and create disaster; I, the LORD, do all these things." Cyrus was spoken of about 200 years before he came to power as the ruler of Persia. There may have been thousands of Cyruses in that time, but God was speaking of a certain Cyrus whom He foreknew. Cyrus was not an ordinary man, but a ruler of the heavenly realms. He did what God commanded him to do because God had given him dominion over all the nations of the earth. At the time, he didn’t actually rule over them, but none would challenge him in battle. Any nation he invaded, however, would have fallen before him – at God’s command provided he did as he was instructed. Though Cyrus ruled through a human king, he was really a prince of the heavenly realms – just like Michael and Gabriel. That he was not human is evidenced in Dan 10:12 "…Do not be afraid, Daniel. Since the first day that you set your mind to gain understanding and to humble yourself before your God, your words were heard, and I have come in response to them. But the PRINCE of the Persian kingdom resisted me twenty-one days. Then Michael, one of the CHIEF PRINCES, came to help me, because I was detained there with the KING of Persia. Now I have come to explain to you what will happen to your people in the future, for the vision concerns a time yet to come." A miserable human prince would not have detained Gabriel in the palace of Darius king of Persia! It was Cyrus – a ruler and prince of the heavenly realms – who did this after throwing a tantrum. But he quickly came to heel after Michael arrived on the scene! Michael is one of the chief princes of God, and is a devastating warrior of great notoriety, and Cyrus backed down. Cyrus was aware of what he faced if he didn’t! He may have found himself eating grass like an ox and growing feathers. It should be pointed out that Gabriel is no slouch as a warrior either. He apparently arrived unprepared for Cyrus’ tantrum, and with no backup, was forcefully detained until Michael arrived, who is the chief Prince of Israel. Gabriel pointed out that he, himself, would return to fight the prince of Persia as a prelude to the prince of Greece arriving as ruler: V20 "So he [Gabriel] said, "Do you know why I have come to you? Soon I will return to fight against the prince of Persia, and when I go, the prince of Greece will come; but first I will tell you what is written in the Book of Truth. (No-one supports me against them, except Michael, your prince. And in the first year of Darius the Mede, I took my stand to support and protect him." – from one of Cyrus’ tirades! Darius the Mede, you will recall is the one who killed Belshazzar, King of Babylon and seized his throne. As it turned out, human kings followed each other in regal succession, but not before Darius had fulfilled God’s requirements through the anointed one, Cyrus. It was Darius the Mede, rather than Cyrus, that Gabriel protected. God has something to say about the rulers of the heavenly realms and the kings of the earth below in Isa 24:21 "In that day the LORD will punish the powers in the heavens above and the kings on the earth below. They will be herded together like prisoners bound in a dungeon; they will be shut up in prison and be punished after many days. The moon will be abashed, the sun ashamed; for the LORD Almighty will reign on Mount Zion and in Jerusalem, and before its elders, gloriously." "The LORD, the God of heaven, has given me all the kingdoms of the earth and has appointed me to build a Temple for Him at Jerusalem in Judah. Anyone of His people among you – may his God be with him, and let him go up to Jerusalem in Judah and build the Temple of the LORD, the God of Israel, the God who is in Jerusalem. And the people of any place where survivors may now be living are to provide him with silver and gold, with goods and livestock, and with freewill offerings for the Temple of God in Jerusalem." Then the family heads of Judah and Benjamin, and the priests and the Levites – everyone whose heart God had moved – prepared to go up and build the House of the LORD in Jerusalem. All their neighbours assisted them with articles of silver and gold, with goods and livestock, and with valuable gifts, in addition to all the freewill offerings." Did you ever wonder why all the so-called Minor Prophets spoke about Jerusalem and the Temple, and why so much prophecy revolves around events there? Well, the so-called Minor Prophets were delivering a message to a certain people who would be actively involved in the fulfillment of everything that has been written, and is therefore, addressed to them. And as every Bible student should know, Jerusalem is the City of God, and it’s from this City that the Kingdom of God will rule forever. It seems logical to most people to ignore the Minor Prophets, and all prophecy for that matter, because it doesn’t seem to apply to them. But to those who have been taught by God, they are very important! And not just the Minor Prophets but all the Prophets (the Nevi’im) are important to those who have been taught by God. And all those who have been taught by God are called the Sons of Jerusalem (John 6:45, Isa 54:13). Satan’s appointees, who love to have preeminence over others, can’t stand to learn that their ‘wisdom’ – which is the wisdom of this world – is futile and worthless. They hate the Sons of Jerusalem – and me in particular – because we have taught things they could never understand. They come nipping at our heels like mangy dogs demanding proof of our authority to teach such things. This was also true in Christ’s day: Luke 20:2 "Tell us by what authority you are doing these things," they said. "Who gave you this authority?" He replied, "I will also ask you a question. Tell me, John’s baptism – was it from heaven or from men?" They discussed it among themselves and said, "If we say, ‘From heaven’, He will ask, "Why didn’t you believe him?" But if we say, ‘From men’, all the people will stone us, because they are persuaded that John was a prophet." So they answered, "We don’t know where it was from." Jesus said, "Neither will I tell you by what authority I am doing these things." God’s enemies know where their own teachings come from though! It comes from their diminutive minds! They have no interest in serving God, but only themselves. It’s very true that those who cannot understand the message of all the Prophets (the Nevi’im) can never understand God’s Plan! And if they did, they would probably hate God because it runs counter to all they have believed. In reality, they’ve plumbed the depths of madness to flange together an appealing doctrine – one that would appeal to all others. All this touches on another subject. Are the Nevi’im (all the Prophets) complete? Is anything missing? Well unless you understand all of what is already written, you would never know. The Truth is that God has withheld information vital to the times just ahead. And those who understand all the Nevi’im know what that gap in knowledge is. This is the one area that all the Brotherhood refrains (or should refrain) from speaking about. The Christ warned of casting pearls before swine: Matt 7:6 "Do not give dogs what is sacred; do not throw your pearls to pigs. If you do, they may trample them under their feet, and then turn and tear you to pieces." Does this Brotherhood really care whether dogs and pigs understand the sacred things of God? No, we don’t because we are of the same opinion as Jesus! The people whom Jesus refers to in this parable are the very ones who don’t accept God’s teachings. They don’t receive it with joy, but turn and tear it to pieces, and then attack the messenger. So what is this missing knowledge? Well, it’s called the Book of Truth. Interestingly enough, after Jesus finished telling Pontius Pilate that His Kingdom was not for that time, but for the future, He concluded by saying: John 18:37 "Everyone who is on the side of Truth listens to me." "What is Truth?" Pilate asked." But he received no further reply. It may seem insignificant, but if it was, then why was it included? The fact is, that only those who listen to the Christ and believe what He said, are on the side of Truth. There are many people who haven’t been listening to Jesus, and consequently have no idea what Truth is. They don’t believe God regardless of the rank of evidence. No amount of evidence is ever enough for them. Well, the truth is that soon they will learn that when dealing with Satan’s brood, no amount of ransom is ever enough to spare their lives! But the Book of Truth fills a narrow gap in prophecy that is only known to those who have the full measure of the Spirit of Prophecy. God has withheld certain information vital to the understanding of this period. In one of our earliest articles I deliberately refrained from talking about this period and gave the reason – because God has not revealed the missing detail! Gabriel alluded to it, and gave some sketchy detail, but the Book of Truth has yet to be delivered. God intends to have it delivered as a little scroll. The contents would be pointless and meaningless to anyone but a prophet of God. So obviously, it will be delivered to a prophet who is preparing the Way for Christ. Apart from Gabriel, two prophets of God refer to this little book or scroll. One was Ezekiel and the other was the prophet John in the Book of Revelation. Ezekiel’s account is as follows: Eze 2:3 "He said, "Son of man, I am sending you to the Israelites, to a rebellious nation that has rebelled against me; they and their fathers have been in revolt against me to this very day." V6 "And you, son of man, do not be afraid of them or their words. Do not be afraid, though briers and thorns are all around you and you live among scorpions. Do not be afraid of what they say or terrified by them, though they are a rebellious House. You must speak my Words to them, whether they listen or fail to listen, for they are rebellious." They are indeed very rebellious! V8 "But you, son of man, listen to what I say to you. Do not rebel like that rebellious House, open you mouth and eat what I give you." Then I looked, and I saw a hand stretched out to me. In it was a scroll, which he unrolled before me. On both sides of it were written words of lament and mourning and woe. And he said to me, "Son of man, eat what is before you, eat this scroll; then go and speak to the House of Israel." So I opened my mouth, and he gave me the scroll to eat. Then he said to me, "Son of man, eat this scroll I am giving you and fill your stomach with it." So I ate it, and it tasted as sweet as honey in my mouth." God confirms again and again that He is referring to the rebellious House of Israel. Eze 3:4 "He said to me, "Son of man, go now to the House of Israel – not to many peoples of obscure speech and difficult language, whose words you cannot understand. Surely if I had sent you to them, they would have listened to you. But the House of Israel is not willing to listen to you because they are not willing to listen to me, for the whole House of Israel is hardened and obstinate. But I will make you as hardened and unyielding as they are. I will make your forehead like the hardest stone, harder than flint. Do not be afraid of them or terrified by them, though they are a rebellious House." And just to include something very important, we find this in the next verse: V12 "Then the Spirit lifted me up, and I heard behind me a loud rushing sound – May the Glory of the LORD be praised in His Dwelling-Place! – the sound of the wings of the living creatures brushing against each other and the sounds of the wheels beside them, a loud rushing sound. The Spirit then lifted me up and took me away, and I went in bitterness and in the anger of my spirit." It seems to be very similar to when Elijah was lifted up in a fiery chariot, doesn’t it? This is the only other example given in the Bible of this type of thing happening, though it’s prophesied to happen again. The scroll was as sweet as honey in the mouth – it was sweet because it is the start of the great mission of the Sons of Jerusalem, but the contents of the scroll are of lament and mourning and WOE – real gut-churning horror – not for the Sons of Jerusalem, but for the rebellious House of Israel. The realization of this horror will still be bitter in the stomach of those who are far away and see it all going on. This is when Satan is hurled back to earth, and it’s reported in these words: Rev 12:12 "Therefore rejoice, you heavens and you who dwell in them! But WOE to the earth and the sea, because the devil has gone down to you! He is filled with fury, because he knows his time is short." The next four verses explain what happens when the devil becomes earthbound: V13-17 "When the dragon saw that he had been hurled to the earth, he pursued the woman who had given birth to the male child. The woman was given the two wings of a great eagle, so that she might fly to the place prepared for her in the desert, where she would be taken care of for a time, times and half a time, out of the serpent’s reach. Then from his mouth the serpent spewed water like a river, to overtake the woman and sweep her away with a torrent. But the earth helped the woman by opening its mouth and swallowing the river that the dragon had spewed out of his mouth. Then the dragon was enraged at the woman and went off to make war against the rest of her offspring – those who obey God’s Commandments and hold to the Testimony of Jesus." Satan now has a very good reason to hate ‘the woman’ but he can’t do a lot about it because, even now, God is protecting this ‘woman’. But once Satan has the courage to make his bid to attack God’s throne, and loses the war and is hurled to the earth – he will come after ‘her’. This woman is the House of David, which is prophesied to be raised up by the one Jesus called ‘Elijah’ (Luke 1:69). It is the House of David that gave birth to the man child Jesus – the Son of David. It was the prophet John to whom the little scroll was delivered in the account in the Book of Revelation in Chapter 10. It too, was sweet as honey in John’s mouth, but after he had eaten it, his stomach turned sour. It was in this regard that seven thunders spoke but John was told to seal it up and not write it: Rev 10:4 "And when the seven thunders spoke, I was about to write, but I heard a voice from heaven say, "Seal up what the seven thunders have said and do not write it down." So this is an important message, but it was never written down by John, and is still sealed up! It awaits an important time in the future. It involves a battle plan for a great war among other things. The details of which will be revealed at the precise moment in time. Rev 10:9 "So I went to the angel and asked him to give me the little scroll. He said to me, "Take it and eat it. It will turn your stomach sour, but in your mouth it will be as sweet as honey." I took the little scroll from the angel’s hand and ate it. It tasted as sweet as honey in my mouth, but when I had eaten it, my stomach turned sour. Then I was told, "You must prophesy again about many peoples, nations, languages and kings." God intended for the prophet John to see and hear these things, but not write them down. John wrote everything else down though! God doesn’t intend to reveal all the details of the knowledge of the secrets of the Kingdom of God to everyone, but only to those who are actively involved in establishing it. The instruction is to them, and will be delivered to them – the sons of Jerusalem – through God’s anointed prophet. This is the way it is! So to all those aspiring prophets out there who speak from their own imagination, they will soon find that their luck has run out. They may even find that their own parents will stab them or perhaps their friends will beat them up (Zech 13:3-6). Suddenly they will come to the realization that God means all that He has said! Very soon now, there will be a famine of the Word of God (Amos 8:11-12), and the false prophets will have a field day. So when they do, don’t forget to do your duty (Zech 13:6). It may well be your last opportunity to show displeasure for those who have lied in God’s Name! Joseph’s Tomb in Nablus in the West Bank. These mindless fools set to work with hammers and picks to demolish the tomb of Ephraim’s father Joseph. Guess who was behind this outrage! It was Satan himself! God has a lot more to say in the Book of Amos: Amos 6:1 "Woe to you who are complacent in Zion [Jerusalem], and to you who feel secure on Mount Samaria (the Northern Kingdom of Israel), you notable men of the foremost nation, to whom the people of Israel come." V6 "You drink wine by the bowlful and use the finest lotions, but you do not grieve over the [desecration] of Joseph. Therefore you will be among the first to go into exile; your feasting and lounging will end. The Sovereign LORD has sworn by Himself – the LORD Almighty declares: "I abhor the pride of Jacob and detest his fortresses; I will deliver up THE CITY and everything in it." We had a situation a few years ago in Nablus, where Palestinians desecrated the very tomb of Joseph, and no-one raised an objection! Not Ephraim, or that City of Washington, not even the Churches! What self-serving hypocrites! But still they insist on giving the Palestinians God’s Land! And just so that deceivers will not beguile you with their lies and tell you that all this has been fulfilled, Amos ends the prophecies with these Words: Amos 9:11-15 "In that day I will restore David’s fallen tent. I will repair its broken places, restore its ruins, and build it as it used to be, so that they may possess the remnant [from] Edom and ALL THE NATIONS THAT BEAR MY NAME," declares the LORD who will do all these things. "The days are coming," declares the LORD, "when the reaper will be overtaken by the ploughman and the planter by the one treading grapes. New wine will drip from the mountains and flow from all the hills. I will bring back my exiled people Israel; they will rebuild the ruined cities and live in them. They will plant vineyards and drink their wine; they will make gardens and eat their fruit. I will plant Israel in their own land, never again to be uprooted from the Land I have given them," says the LORD your God." So God has made contingency plans for the rescue of the nations of Israel who bear His Name. In 70 AD, a similar situation developed in Jerusalem. Jesus’ prophecy concerning the Temple suddenly came true and the Temple was demolished, and many people concluded that all prophecy had been fulfilled. Later, exactly seventy years after Jesus began his ministry on earth, a scroll was delivered to Jesus by the Father (Rev 1:1), and the contents were passed on to John. Here was evidence at that time, that the Scriptures were not complete. What is more, it was delivered primarily for the Church of God so they could understand what the Nevi’im (all the Prophets) wrote about. It was written rather cryptically, and as such, was not understood. Though down through the ages, many thought they understood it. In fact, it couldn’t have been understood, because the time had not come for this understanding. Its teachings were similar to that taught by Noah, the preacher of righteousness, just before the flood came and swept them all away. And so generations have come and gone, and the fulfillment of the Book of Revelation has still not been realized. Most importantly, Jesus has still not returned as King of Kings and Lord of Lords. But we are assured in the Book of Revelation exactly what these descriptions of Christ mean. Furthermore, the destruction and death described in this Book are almost unthinkable in human terms. The Altar of the Temple. This artists impression shows the ziggurat shape of the Altar of God, and it’s this design they are emulating when they built their giant ziggurats in honour of their gods. 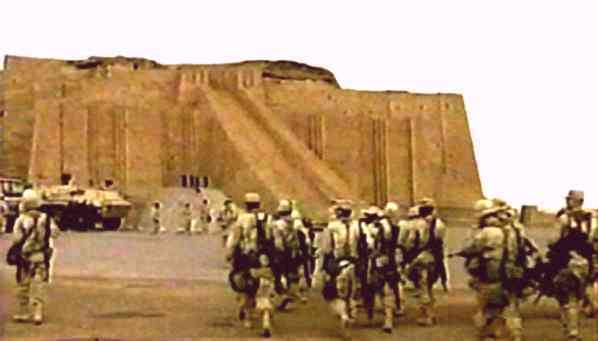 U.S. troops (2003) visit the Ziggurat of Ur of the Chaldees – the birthplace of Abraham. This is a reconstruction of the once derelict ziggurat, and was rebuilt by Saddam Hussein. The remains of the old ziggurat are still visible at the top of the structure. Construction is not completed yet. Notice the similarity between this ziggurat and the Altar of God. 1st year of Cyrus king of Persia: - 1st day of the 7th month (the Feast of Trumpets) they began to offer burnt offerings to the LORD, though the foundation of the LORD’S Temple had not been laid. Ezra 3:2 "Then Joshua son of Jozadak and his fellow priests and Zerubbabel son of Shealtiel and his associates began to build the altar of the God of Israel to sacrifice burnt offerings on it, in accordance with what is written in the Law of Moses the man of God. Despite their fear of the people around them, they built the altar on its foundation and sacrificed burnt offerings on it to the LORD, both the morning and the evening sacrifices. Then in accordance with what is written, they celebrated the Feast of Tabernacles with the required number of burnt offerings prescribed for each day. After that, they presented the regular burnt offerings, the New Moon sacrifices and the sacrifices for all the appointed feasts of the LORD, as well as those brought as freewill offerings to the LORD. 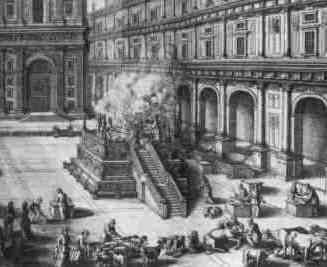 On the first day of the seventh month they began to offer burnt offerings to the LORD, though the foundation of the LORD’S Temple had not been laid." 2nd Year of King Darius – 1st day of the 6th month: (Haggai 1:1) God says it’s time to cut timber and build His House. 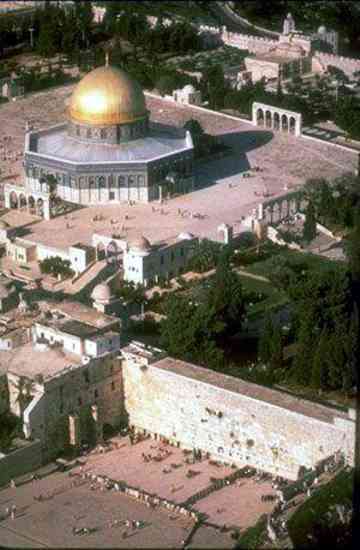 The Rock – the Temple of God is now housed in a satanic mosque on the Temple Mount. This Rock is the Most Holy Place. Ezra 3:8 "In the second month of the second year after their arrival at the House of God in Jerusalem, Zerubbabel son of Shealtiel, Joshua son of Jozadak, and the rest of the brothers (the priests and the Levites and all who had returned from the captivity to Jerusalem) began the work, appointing Levites twenty years of age and older to supervise the building of the House of the LORD." Notice the reference here concerning their arrival at the House of God to begin building the House of the LORD. The House of God is actually the Rock – the Most Holy Place. The man-made House of the LORD is merely an extension of the Rock. God has appointed His servants the Levites to supervise and build the House for the Rock. This Rock represents Jesus Christ. Furthermore, this is where He will dwell forever: Eze 43:7 "He said, "Son of man, this is the place of my Throne, and the place for the soles of my feet. This is where I will live among the Israelites forever. The House of Israel will never again defile my Holy Name…"
2nd year of King Darius – 24th day of the 6th month: They began work on the LORD’S House. 2nd year of King Darius – 21st day of the 7th month: (Haggai 2:1) (The 21st of the 7th Month is the last day of the Feast of Booths or Tabernacles). Who of you is left who saw this House in its former glory? 2nd year of King Darius – In the 8th month: (Zech 1:1) "Return to me, and I will return to you," says the LORD Almighty." (see Mal 3:6). 2nd year of King Darius – 24th day of the 9th month: (Haggai 2:10, 18) "From this day on I will bless you"
2nd year of King Darius – 24th day of the 11th month, the month of Shebat: (Zech 1:7) "During the night I had a vision – and there before me was a man riding a red horse! He was standing among the myrtle trees in a ravine. Behind him were red, brown and white horses." In V12 "Then the angel of the LORD said, "LORD Almighty, how long will you withhold mercy from Jerusalem and the towns of Judah, which you have been angry with these past 70 years?" 3rd year of Cyrus (Darius) – 24th day of the first month: (Dan 10:1). Daniel alone saw a vision of a man dressed in linen who had come to explain the meaning of the former vision. Gabriel told Daniel that soon he would return to fight the PRINCE of Persia, and when I go, the PRINCE of Greece will come. But he wanted Daniel to know what will happen first, that is, what is written in the Book of Truth. The Book of Truth is what God has written in the scroll that Gabriel was asked to explain (V20). It’s here that Gabriel explains that in the 1st year of Darius the Mede that he took his stand to protect him (Dan 11:1). 4th year of King Darius – 4th day of the 9th month (the month of Kislev: (Zech 7:1). V4 "When you fasted and mourned in the 5th and 7th months for the past 70 years, was it really for me you fasted?" 6th year of King Darius: Ezra 6:12 "…I Darius have decreed it. Let it be carried out with diligence." Then, because of the decree King Darius had sent, Tattenai, governor of Trans-Euphrates, Shethar-Bozenai and their associates carried it out with diligence. So the elders of the Jews continued to build and prosper under the preaching of Haggai the prophet and Zechariah, a descendant of Iddo. They finished building the Temple according to the command of the God of Israel and the decrees of Cyrus, Darius, and Artaxerxes, kings of Persia. The Temple was completed on the 3rd day of the month Adar, in the 6th year of the reign of King Darius." V19 "On the 14th day of the first month, the exiles celebrated the Passover." V22 "For seven days they celebrated with joy the Feast of Unleavened Bread, because the LORD had filled them with joy by changing the attitude of the KING OF ASSYRIA, so that he assisted them in the work on the House of God, the God of Israel." Darius was a Mede, and was called the KING OF ASSYRIA, because the Medes are the Assyrians! The Medes were aligned with the Persians and formed the Medo-Persian Empire. Even today they are aligned with them as Shiites, while the vast majority of Moslems are Sunni. The Medes are now known as the Kurds, and occupy parts of northern and southern Iraq and parts of Turkey with a few others scattered around the region. Josephus was of the opinion that Cyrus had been killed in a battle against the Scythians and Massagetae in Antiquities, Book 11, ch. 2:20, but the annotations cast grave doubt on this. Furthermore, the chroniclers of Alexander the Great confirm that Alexander found Cyrus’ tomb in Passargadae, near Persepolis, and confirm that he died peacefully. This was the same Mede who at the age of sixty-two had seized the Babylonian kingdom and was called Cyrus and Darius (who at the age of 62 became their first king). His sons ruled after him. In fact one of his descendants is Darius III, who was killed by Alexander the Great in the battle of Arbela. Cyrus is almost worshipped as the father of the Medo-Persian Empire. Every ruler in the past seemed to want to be associated with him and his tomb. The tomb of Cyrus near the ancient city of Persepolis. Notice the ziggurat shape and the ‘everlasting’ temple-shaped house on the top, denoting the princely stature of this ruler of the heavenly realms (see Isa 14:18-19 for a mention of the tombs of these rulers.) 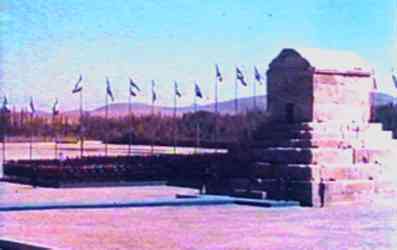 Persian rulers like to have their coronation at this site, including the Shah of Persia. It’s certainly true that successive kings ruled in Persia, but Cyrus was the real ruler. The Book of Truth speaks of these, and Gabriel confirms it in Dan 11:2. Almost every history book you pick up will tell you that Cyrus was the first Persian king, because this is the way the Persians wanted to remember it. The Bible however, says this: Dan 5:30 "That very night Belshazzar (the grandson of Nebuchadnezzar), king of the Babylonians, was slain, and Darius the Mede took over the kingdom at the age of 62." I recall one history book claiming that Darius the Mede came 62 years after Cyrus came to power. Whoever wrote it obviously doesn’t believe the Bible. 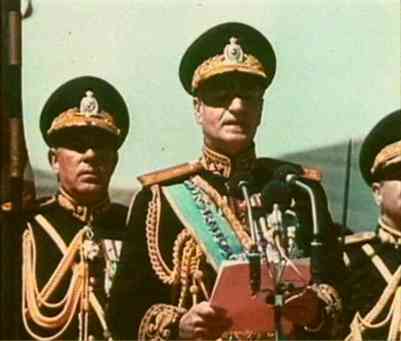 Shah Mohammid Reza Pahlavi at his coronation at the foot of Cyrus’ tomb. He was deposed a few years later by Ayatollah Homeini. 7th year of Artaxerxes - Ezra 7:1 "After these things, during the reign of Artaxerxes, king of Persia, Ezra, son of Seraiah, the son of Azariah, the son of Hilkiah, the son of Shallum, the son of Zadok, the son of Ahitub, the son of Amariah, the son of Meraioth, the son of Zerahiah, the son of Uzzi, the son of Bukki, the son of Abishua, the son of Phineas, the son of Eleazar, the son of Aaron the chief priest – this Ezra came up from Babylon. He was a teacher well versed in the Law of Moses, which the LORD, the God of Israel, had given. The king had granted him everything he asked, for the hand of the LORD his God was on him. Some of the Israelites, including priests, Levites, singers, gatekeepers and Temple servants, also came to Jerusalem in the 7th year of Artaxerxes. Ezra arrived in Jerusalem in the 5th month of the 7th year of the king. He had begun his journey from Babylon on the 1st day of the 1st month, and he arrived on the 1st day of the 5th month, for the good hand of his God was on him. For Ezra had devoted himself to the study and observance of the Law of the LORD, and to teaching its decrees and Laws in Israel." 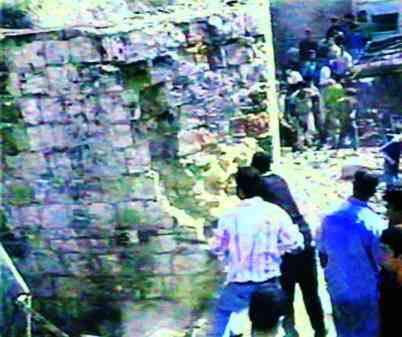 20th year of Artaxerxes – Jerusalem was in ruins once again. The walls had been broken down, and the gates burned with fire (Neh 1:3) and the people who escaped the exile were still in the province and in great trouble and disgrace. Nehemiah arrived to get things moving again. In the 32nd year of Artaxerxes king of Babylon Nehemiah had returned to the king (Neh 13:6). Now there’s a twist. Artaxerxes is the king of Babylon, even though of Persia. The kings reigned in Babylon, and were still reigning there when Alexander the Great came on the scene. The reason is that Babylon is Satan’s preferred city. This is where he desires to reign once more. On returning from Babylon, Nehemiah discovered that Tobiah – the worst troublemaker imaginable, was occupying a room in the courts of the House of God. Nehemiah immediately pelted his gear out the door, and restored the room to its proper purpose (Neh 13:7-9). Tobiah was an Ammonite (Neh 2:19 – though he claimed to be of the priesthood – Neh 7:61-62), and mixed with Arabs (Neh 4:7), and a certain prophetess called Noadiah (Neh 6:14) who had managed to convince some of the prophets to support himself, Tobiah, and Sanballat against the prophet Nehemiah. Nehemiah was too smart to fall for their plots (Neh 6:10-14). This is the same Tobiah that had set himself up in the outer Court of the Temple Mount in grand style, even after he had tried to stop the Work and even plotted to kill Nehemiah. All this after he had claimed to be of the Levite priesthood! It shows how dangerous some of these wanna-be’s can be. Tobiah was a power-broker who wanted power over everything. At no time did he have any intention of serving God in a Godly manner. In a complete reversal of Tobiah’s ambition, it was discovered in the Scriptures the following indictment against him as an Ammonite: Neh 13:1 "On that day the Book of Moses was read aloud in the hearing of the people and there it was found written that no Ammonite or Moabite should ever be admitted into the assembly of God, because they had not met the Israelites with food and water but had hired Balaam to call a curse down on them. (Our God, however, turned the curse into a blessing.) When the people heard this Law, they excluded from Israel all who were of foreign descent." This would be good advice even today, to clear the Holy Land for a fresh start. Of course, even those of foreign descent enjoy full citizenship under the Law of Moses – provided they live according to the Laws given to all Israel. These would obviously not be included in the expulsion. It made a lot of sense to the people to get rid of all dissenters. Speaking of the endtime, Daniel wrote of a similar situation that would arise. What he wrote was spoken to him directly from the Book of Truth: Dan 11:31 "His armed forces will rise up to desecrate the Temple fortress and will abolish the daily sacrifice. Then they will set up the abomination that causes desolation. With flattery he will corrupt those who have violated the Covenant, but the people who know their God will firmly resist him. Those who are wise will instruct many, though for a time they will fall by the sword or be burned or captured or plundered. When they fall, they will receive a little help, and many who are not sincere will join them. Some of the wise will stumble, so that they may be refined, purified and made spotless until the time of the end, for it will still come at the appointed time." Clearly, we have a situation similar to the one that Nehemiah experienced. There will be trouble on all sides with insincere people joining the defenders of the City, and trying to make peace deals with the invaders. These are the type of people who always compromise God’s Truth and violate His Covenant. Cunning and crafty, everything they do is for their own advantage. But the end is not yet. You may be wondering what all of this has to do with seventy ‘weeks’. Well in order to understand you have to know what was happening at the time the declaration was made. And what was happening at that time is crucial to the clear understanding that God is giving to His servants as they go forth to fulfill all prophecy. God has never promised an easy road to victory, and victory will only be declared when all the Kingdoms of the world become the Kingdoms of our Christ, and when He is able to hand them over to the Father. As in the days of Daniel, Ezra, Nehemiah, Ezekiel, Joshua, Haggai, Zerubbabel, Zechariah and the rest of the servants of God of that era, there were many decisions to be made, and great strategy was always in place. God is not in the habit of waving a magic wand, and ensuring that everything is automatically done according to a predetermined script. Students of the Bible will be aware that anciently, in the many wars fought by the House of Israel against God’s enemies, the battle did not always go their way. At one stage, the battle advanced or regressed according to when Moses upheld his arms (Ex 17:10-13). As you can imagine, an army in retreat usually gets slaughtered. All the prophecies of Daniel can be summarized in the following: Dan 8:13 "Then I heard a holy one speaking, and another holy one said to him, "How long will it take for the vision to be fulfilled – the vision concerning the daily sacrifice, the rebellion that causes desolation, and the surrender of the sanctuary and of the host that will be trampled underfoot?" He said to me, "It will take 2300 evenings and mornings, then the sanctuary will be re-consecrated." And in V26 "The vision of the evenings and mornings that have been given to you are true, BUT SEAL UP THE VISION, for it CONCERNS THE DISTANT FUTURE." Then a man in linen appeared and proclaimed the final outcome: Dan 12:5 "Then I, Daniel, looked, and there before me stood two others, one on this bank of the River and one on the opposite bank. One of them said to the man clothed in linen, who was above the waters of the waters of the River, "How long will it be before these astonishing things are fulfilled?" The man clothed in linen, who was above the waters of the River, lifted his right hand towards heaven, and I heard him swear by Him who lives forever, saying, "It will be for a time, times and half a time. When the power of the holy people has been finally broken, all these things will be completed." Daniel had formerly understood the visions he had received, and realized what they meant in his time, but then he realized there was much more to it: V8 "I heard, but I did not understand. So I asked, "My Lord, what will the outcome of all this be?" He replied, "Go your way, Daniel, because the words are closed up and sealed to the time of the end. Many will be purified, made spotless and refined, but the wicked will continue to be wicked. None of the wicked will understand, but those who are wise will understand. From the time that the daily sacrifice is abolished and the abomination that causes desolation is set up, there will be 1290 days. Blessed is the one who waits for and reaches the end of the 1335 days. As for you, go your way till the end. You will rest (in the grave), and then at the end of the days you will rise (speaking of the resurrection) to receive your allotted inheritance." (‘My reward is with me’ Isa 40:10, Rev 22:12). To understand the time setting, we need to go back to Dan 12:1-4 "At that time Michael, the great prince who protects your people, will arise. There will be a time of distress such as has not happened from the beginning of nations until then (this is what Jesus spoke of in Matt 24:21). But at that time your people – everyone whose name is written in the Book (of life) will be delivered. Multitudes who sleep in the dust of the earth will awake, some to everlasting life, others to shame and everlasting contempt. Those who are wise (or who impart Wisdom – margin) will shine like the brightness of the heavens (the sun), and those who lead many to righteousness, like the stars for ever and ever. But you, Daniel, close up and seal the words of the scroll until the TIME OF THE END. Many will go here and there to increase knowledge." The TIME OF THE END means the end of an era or age. Up to this time – this end or era – the meaning of the words of the scroll have been CLOSED UP AND SEALED. It was left to the One who has been raised from the dead, after going as a Lamb to the slaughter, to break the seals, open the scroll, and reveal the contents. There are a total of seven seals (Rev 6:1). The seals are successively opened one after the other. This scroll contains the content of what Daniel sealed. What this scroll contains is all that Daniel wrote, and it reveals what he didn’t understand. This understanding was for the time of the end! It’s hard to imagine how so much nonsense could have been written concerning these seals. But considering how Christianity has been insisting on reading only the pure ‘gospel’, meaning: ‘Lose the prophecy! We don’t want to know anything about it! ), it’s not surprising that they see no value in the Scriptures that Christ used. This is written in the Scripture that Christ used: Isa 30:8 "Go now, write it on a tablet for them, inscribe it on a scroll, that for the days to come it may be an everlasting witness. These are rebellious people, deceitful children, children unwilling to listen to the LORD’S instruction. They say to the seers, "See no more visions!" and to the prophets, "Give us no more visions of what is right!" Tell us pleasant things, prophesy illusions. Leave this way, get off this path, and stop confronting us with the Holy One of Israel!" Therefore, this is what the Holy One of Israel says: "Because you have rejected this message, relied on oppression and depended on deceit, this sin will become for you like a high wall, cracked and bulging, that collapses suddenly, in an instant. It will break in pieces like pottery, shattered so mercilessly that among its pieces not a fragment will be found for taking coals from a hearth or scooping water out of a cistern." This is what the Sovereign LORD, the Holy One of Israel says: "In repentance and rest is your salvation, in quietness and trust is your strength, but you would have none of it. You said, ‘No, we will flee on horses.’ Therefore you will flee! You said, ‘We will ride off on swift horses.’ Therefore your pursuers will be swift! A thousand will flee at the threat of one; at the threat of five you will all flee away, till you are left like a flagstaff on a mountaintop, like a banner on a hill (totally exposed)." It would require a thick book to explain all that is spoken of here. But you owe it to yourself to read the whole chapter of Ezekiel 13, which gives much more detail. In speaking of the tablet and scroll, we find that Ezekiel was given a scroll. But first we should mention the prophet Habakkuk, who was instructed to write on a tablet so that it would last a long time, rather than a scroll that turns to dust after a few years: Hab 2:2 "Then the LORD replied, "Write down the REVELATION and make it plain on tablets." Even though the Babylonians were at the very gate at that time, Habakkuk was told to write this REVELATION down on a long-lasting tablet! V3 "For the REVELATION awaits THE APPOINTED TIME; IT SPEAKS OF THE END and will not prove false. Though it linger, wait for it, it will certainly come and will not delay." Those who hate prophecy and insist on only reading the pure ‘gospel’ – according to their definition – will not believe this speaks of the time of the end! And it seems that some of them think it’s speaking of another universe beyond the stars somewhere, where ‘all the good people go when they die’. There are some bizarre theories circulating at the moment! In the Book of Daniel we learn that it is written in the Book of Truth that three more kings would appear in Persia and then a fourth, who would be far richer than the others Dan 11:2 "Now then, I tell you the Truth: three more kings will appear in Persia, and then a fourth, who will be far richer than all the others. When he has gained power by his wealth, he will stir up the kingdom of Greece. Then a mighty king will appear (Alexander the Great), who will rule with great power and do as he pleases. After he has appeared, his empire will be broken up and parceled out towards the four winds of heaven. It will not go to his descendants, nor will it have the power he exercised, because his kingdom will be uprooted and given to others." This is precisely what happened to Alexander the Great, and he died at the age of 32. If all this were merely history, then it would be interesting, but hardly important. Since a prophet (Daniel) recorded it, there is far more to it than surface interest. Since some 360 years after Alexander Jesus spoke of these things as future events, it’s reasonable to suggest that it involves prophecy which remains yet to be fulfilled at the very end time. The Christ referred to the prophecies of Daniel as being of great relevance at a dangerous and future time (Matt 24:15). He was speaking of the end of the age (V3). There still remains much prophecy to be fulfilled – in fact, most prophecy remains unfulfilled, because most of it pertains to the period we are now living in. God swore an oath to Abraham that He would give the Holy Land to his descendants forever. Almost all prophecy relates to the fulfillment of this promise. God has determined to bring all 12 Tribes of Israel back to the Holy Land to take up their allotted portions. The problem is they are not going to do it peacefully, and they would certainly resist any suggestion from God that they do return. Having fought for and developed their own lands, the descendants of the Patriarchs, the House of Israel, would firmly resist leaving to enter the most politically and religiously explosive region on earth (thanks for the offer, they say, but no thanks!) The House of Israel reasons that the Jewish people are used to terrorism and persecution, and so they are quite happy to let them keep the Holy Land for themselves. The United States of America feel they’ve done enough fighting to secure their land. As a fledgling nation they were forced to endure great hardship, national and civil wars, in order to earn their right to occupy the New Land. They love their land and are not about to give it up – not even for God! How different they are to the men of God! Here’s how the men of God viewed things: Heb 11:13 "All these people were still living by faith when they died. They did not receive the things promised, they only saw them and welcomed them from a distance. And they admitted they were aliens and strangers on earth. People who say such things show they are looking for a country of their own. If they had been thinking of the country they had left, they would have had opportunity to return. Instead, they were longing for a better country – a heavenly one. Therefore God is not ashamed to be called their God, for He has prepared a city for them." Of all the people on the earth, the U.S. should have compassion on little Israel. The Israelis have sought a country of their own, and they have chosen the one God planned for them – the one He gave to the Patriarchs. The Jewish people suffered humiliation, persecution and death wherever they settled, and went virtually as sheep to the slaughter. There was no country for them to call their own, and many died in faith knowing that God would one day fulfill His promise and give the land to their offspring. Judah became the new birth in the New Land – the Holy Land. And for this Land they are prepared to fight to the death! So strong is their resolve that 5 million Israelis hold off and intimidate 1000 million Moslems who surround them to all points of the compass. And God is watching! But Ephraim, the prince among his brothers, the mighty bull that gores the nations to the ends of the earth, has yet to learn this lesson. They know how treacherous Islam is; yet they seem to want to bring them peace. Leaving aside the fact that God has given the Holy Land to Judah – which He foretold, Ephraim is firmly convinced that God gave them their land – and God even confirms this. But God also confirms that the time will come when Ephraim will desire the Land that God gave to the Patriarchs, but not through peaceful means but in time of a great war. The smartest thing that Ephraim could do right now is to utterly drive out all of Islam and all foreigners from the Holy Land, and to beat up any nation that raises its head. They should issue an ultimatum that any nation that transgresses the border of the Holy Land will be committing a hostile act of war. If this seems a bit rich for you blood, be assured that such a declaration will be made – but not by Ephraim. God has a different Plan in place, and when implemented, you will truly know that salvation is of the Jews. And then you will also know who the enemies of God are! Yes, it’s Islam, and everyone who thinks like or supports Islam in any fashion. God will make sure that none of these people cross the threshold to stand in the Assembly of God. The oddest thing about Ephraim is that their nation was born of wars and conflicts, during which they were very vulnerable indeed. Thirteen colonies, small and vulnerable, were established in a great sea of hostility. The French owned the lion’s share of the land (which was later bought from Napoleon as the ‘Louisiana Purchase’), and were well established in Quebec. Virginia was owned by King James I of England (who was James VI of Scotland), they had Indians sniping at their borders, Germans and Dutch in Pennsylvania and New York (formerly New Amsterdam 1626-64), but despite the diversity, they had visions of a United States of America. But first they had to throw off the shackles of British and French rule and gain autonomy. Well they decided on a ‘tea-party’ at Boston, and the die was set for the Declaration of Independence in 1776. Eighty five years later in 1861 the country divided between the north and the south, and the Civil War began. King James I of England favoured the religion of the ancient Celts – Jacobean Christianity, while Henry IV of France favoured Roman Catholicism. All of which served to complicate matters. King James the First had established Jamestown by transporting his fellow-countrymen (he was a Celtic Scot) in the hope of beginning a nation favourable to his beliefs. King James is the one who ordered the translation of the KJV of the Bible. He was a devout man until he became involved in Anglo-Saxon-English politics, and learned the power of the Anglican Archdiocese. Though he tried to put them back in their box, he soon learned that they were king-makers – or king-breakers. And of course, King James inherited the title of ‘Defender of the faith’ (see KJV foreword), which was originally, in 1534, ‘Supreme head of the English Church’ by an Act of Parliament introduced by Henry VIII. Henry also introduced into the Act the threat of ‘praemunire’, which alluded to treason against anyone who showed allegiance to a foreign power – allegiance to the Papacy is what he had in mind, and which he resolved to abolish! The 13 Colonies. Isolated and vulnerable to other nations wanting to muscle in, the 13 colonies grew and prospered, and sought independence from their own respective motherlands. 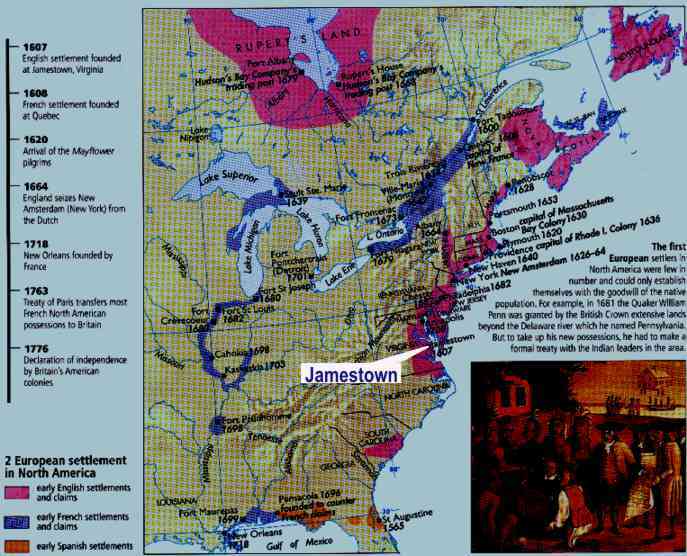 King James I sent his wards to establish Christianity in Jamestown (named after him). Three years before, he authorized the complete translation of the Bible into the English language. He wanted to end the practice of using Latin as the official Christian language, and to make God’s Word accessible to the masses. The translation was completed in 1611. Everything changed under King James I who had a completely different style of rulership, and parliament was able to conduct business in a calmer atmosphere without threats of ‘praemunire’. By this time, England was a protestant nation and it was determined that God’s Word would be presented in a language that all understood, rather than the Latin enforced by the Catholics, and which only the educated gentry understood. Making the Word of God available in a language that all understood became the single most effective way of creating a God-fearing nation. Soon it became law in England that every jailed prisoner was to have access to the Bible. King James seemed to understand that divisions ran deep in his country concerning religion. Catholicism still had a strong base, so he determined to provide religious instruction in the colonies, based not on the obscurities of Latin, but the effectiveness of the English language. With English, German, Dutch, French, Swedish, Spanish, and a wide mix of European languages taking hold in the New Land, it was the English Bible (the KJV) that consolidated the English language in the colonies. The solution to religious division was to provide laws of religious freedom, and penalties for violations of these rights. Whereas Europe had mastered the art of dictating religious behaviour (generally Catholicism or Protestantism) and enforcing it, the United States of America was determined to give the right of freedom to worship as one saw fit. It was a good solution to an age-old problem, but it also opened the door to all sorts of excesses. The purpose of granting religious freedom and the right to worship was to end the centuries-old rift between Catholics and Protestants. As a Christian nation it was decided that living under Christian principles would hold the fledgling nation in good stead, and invoke the blessings of God. It was never intended that the heathen practices of the Indians, Incas, Aztecs and all the ruthless people of South America should have any rights to practice their religion. These were all locked into the category of ‘heathens’ and killing them was not considered a crime. Driving the heathen from the land was thought desirable, especially when the 13 colonies considered themselves to be the lost Tribes of Israel, and used 13 stars to identify themselves in accordance with the dream of Joseph (Gen 37:9-11). LEFT: The 13 stars and 13 stripes. ‘Some circumstances indicate that the Union Jack had already been replaced by the star-filled canton in 1776, and that the Continental Congress’s resolution of 14th June, 1777 only confirmed the design already in use. Substantiating the theory is the terse wording of the Resolution: ‘Resolved, that the Flag of the United States be 13 stripes alternate red and white, that the Union be 13 stars white in a blue field representing a new constellation.’ It’s interesting that they should mention a constellation, because on the above eagle (right), there are four stars separated from the others, and they are arranged like Orion, which is mentioned by Job in Job 9:9, and by God in Job 38:31, and by Amos in Amos 5:8. Having regard for what these verses say, it’s probably no coincidence. It may also be a coincidence that Orion is worshipped as Osirus the Egyptian god, and is it also a coincidence that the American flag (middle above) was first described thus: "One of the earliest accounts of the symbolism of the flag is by Alfred B. 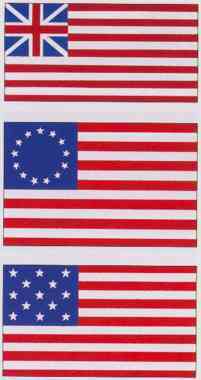 Street, who in October, 1777 witnessed the flag at the surrender of the British General Burgoyne at Saratoga: ‘The stars were disposed in a circle, symbolizing the perpetuity of the Union; the ring, like the circling serpent of the Egyptians, signifying eternity. 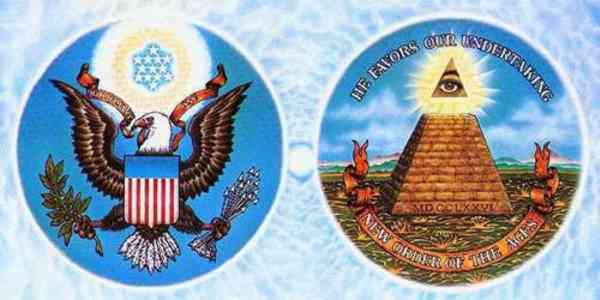 The thirteen stripes showed with the stars the number of the United Colonies, and denoted the subordination of the States of the Union, as well as equality among themselves.’"
But it’s certainly no coincidence that the Great Pyramid of Egypt appears on the Great Seal of the U.S. and on the greenback. 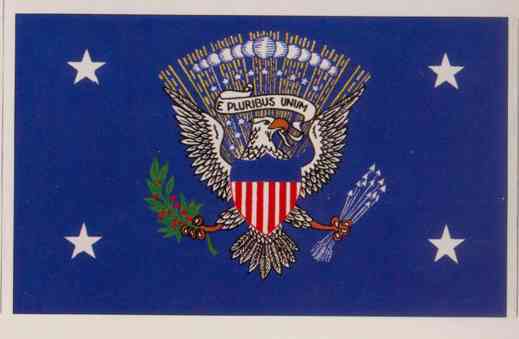 RIGHT: Presidential Flag of the United States (1888-1945). Depicted on the eagle are 13 stars, 13 stripes, 13 arrows, and apparently, 13 planets. I might add that they also included a holly branch with 13 berries, which blooms at Christmas. Holly is grown on the holly oak tree. Why they chose a symbol of an oak tree would indicate a dearth of judgment. This symbol has long been associated with the Saturn-alia or Christmas. Hopefully, the intent was that all 13 arrows would be pointed at Satan’s brood, but who knows? While the number of stars on the flag have now increased to fifty, the number of stripes remains at 13. The fact that the symbol for the states are divided between red and white could also be significant. It seems that even flags can be signs and symbols. Credit: Pictures and quotations: Illustrated Encyclopedia of The World of Flags. Concerning the Saturnalia, it was while Satan was living in Anatolia (Turkey today) in the second or third century of this era that he issued a decree that all Christians had to honour him by wearing the xenon, the rings of Saturn around their heads. Dutifully, the rulers of the heavenly realms established the tradition. From that time on, organized Christianity began to cascade into paganism. From this period we see tiled mosaics beginning to appear depicting ‘saints’, monks, and even ‘Christian’ rulers all wearing this halo around their heads. The observance of a day of honour was made mandatory, and this was set at the 25th day of the tenth month (December) and was called Saturnalia. Those who don’t want to live as God has instructed face a very bleak future. There’s going to be a reconciliation of all the House of Israel, and they will live in God’s Land again as they did originally. There’s going to be a change of heart, and they will no longer desire to live like pagan nations. But no amount of verbal persuasion will bring this about. It’s going to take an upheaval unlike anything that has occurred on earth at any time. One thing the whole House of Israel will learn soon is that they must not build the devil’s work for him. Christ came to destroy the devil’s work (1John 3:8), but silly Ephraim seems determined to build it, rather than to destroy it. And whenever they do, they are hated for it! Satan’s brood doesn’t appreciate kindness – and they view it only as weakness. God has given Ephraim mighty power to beat the tar out of Satan’s brood to the ends of the earth; He says nothing about rebuilding them. Changing a leader doesn’t change a nation from being Satan’s brood. It requires a complete change of heart and mind. Because Ephraim is determined to do things counter to God’s intentions and instructions, God is fast losing patience with them. Whenever Ephraim decides that ‘political correctness’ overrides God’s instructions, they find themselves in trouble, and it’s become the ruling agenda. They seem determined to bring peace to Satan’s brood when there is no sign of peace. The arch-rebel Satan can’t believe his luck that Ephraim is willing ‘to rebuild his fallen tents’. God is not interested in them building Satan’s fallen tents; He is only interested in them rebuilding David’s fallen tents in the Holy Land (Amos 9:11). The saints are always God’s people – these are the ones who have God’s Holy Spirit. Ephraim and Judah are not – yet! If God withdraws His favour, then they are no longer His people. God records a parable about this very thing in Hos 1:2-11. It speaks of the Day of Jezreel and is the day when Judah and Ephraim are once again united as one nation with one leader. This is the recovery spoken of in prophecy, and it will be a great day. For the first time, God will pour out His Spirit on all the House of Israel (Eze 36:26) and Judah and Ephraim will be united as one nation (Eze 37:15-27). The first day after the "truce" announcement by the terrorist organizations. 0047: Mortar shells were fired toward Israeli villages in Gush Katif. 0200: Arab threw an object toward an IDF Jeep in Beit Furik and caused to an accident of the jeep with other vehicle. 0231: Arabs threw Molotov cocktails toward an IDF jeep near the village of Haja. 0627: Stone throwers near Kfar Salem wounded a soldier. 0638: An explosive belt was found by the IDF in Tulkarem. 1322: Fire toward a Romanian truck driver near Yabed. The worker deceased 10 minutes later. 1542: Arabs fired on an IDF post near Nezarim trail. 1549: Arabs fired toward security guards near the new security fence in Qalqilia. the U.S. will wash their hands of the whole affair. Up to this point, the Palestinians have ignored this ‘roadmap to peace’ and continued to rain death on the Israelis. Reluctantly they have agreed to a 3-month ‘truce’ – which hasn’t held at all! The only reason they agreed to the ‘truce’ was to allow the Israelis to dismantle all the Israeli settlements in the West Bank. Washington appears to believe that it’s a real truce! All these Moslem swine want is for the world to think it’s a truce, so they can keep accusing the Israelis of breaking it. You have to search hard to find all these violations (see inset) by the Palestinians because the Western Press is not reporting it. It seems that everyone wants to believe that progress is being made. But time is fast running out for Ephraim to get their act together and to start recognizing who the enemy is. Up until now their silly platitudes have only inflamed the situation and given Islam an expectation that their avowed and stated goal of the destruction of the Western World has legitimacy. If the Israelis were to make the same claim against Islam then it would alienate the whole world. But the day is fast approaching when statements like this from Islam will be taken at face value, and will be responded to with overwhelming force. They’ll be held accountable for every word and every syllable. And the ‘force majeure’ will be the people of God, and the Jewish people will join them (Zech 12:5-6). The Jewish people have already suffered for too long, in fact they have paid double for their sins (Isa 40:1-2), but they alone have remained faithful to the City of God. God is only concerned for those who grieve and lament for the detestable things that are done in it (Eze 9:4). But Ephraim is oblivious to all that is happening. They are unprepared for the disasters that await them. The Churches of God have deluded themselves, and they too, are unprepared for their destiny. Before they inherit the Kingdom of God they have some service to perform. And even at this present time they still don’t understand who God’s enemies are! They have no prophets, but they do have plenty of false prophets who continue to beguile them with lies. And while they continue to prophesy from their own imaginations, they are very coy about claiming to be prophets! When their prophecies fail (with monotonous regularity) they can always claim that their prophecies were not given under oath, and were merely opinions. God has some good news for them: they aren’t prophets! The bad news is they have been lying in God’s Name! And this carries a severe penalty: Hos 6:1 "Come, let us return to the LORD. He has torn us to pieces but He will heal us; He has injured us but He will bind up our wounds. After two days He will revive us; on the third day He will restore us that we may live in His presence. Let us acknowledge the LORD; let us press on to acknowledge Him. As surely as the sun rises, He will appear; He will come like winter rains, like the spring rains that water the earth. What can I do for you, Ephraim? What can I do for you, Judah? Your love is like the morning mist, like the early dew that disappears. Therefore I cut you to pieces with my prophets, I killed you with the words of my mouth; my judgments flashed like lightning upon you. For I desire mercy, not sacrifice (see Matt 12:7), and acknowledgement of God rather than burnt offerings. God is certainly not talking about two literal days here because you could sleep for two days and hardly notice them. No, He’s speaking of a much more serious timescale than this. And it’s certainly directed to Ephraim and Judah – not the Church of God – but – the Church of God is linked to the destiny of Ephraim and Judah! Though they have never acknowledged this! There have been enough goons trying to work out the meaning of Dan 9:24-27 in the total absence of any Wisdom of God or any idea of what they are talking about. They usually multiply apples and lemons and give the answer in fruitcake. God in His mercy has given us fair warning of such people, together with some good advice in Matt 7:1-23, and they need to take note! It’s hard to imagine why people who are so deficient in basic knowledge should be so fanatical about wanting to understand the message of Dan 9:24-27 when it clearly has to do with those appointed to build God’s Temple according to the specifications detailed in Eze 40 to 48. What we speak in this Brotherhood is of no value if you don’t believe God. What purpose would be served to know things that will never be of benefit to you? It seems not to have been noticed by all the aspiring ‘prophets’ who interpret God’s Word from their own imaginations, that all the so-called ‘minor prophets’ were speaking of the Holy Land in relation to all these things. Daniel, Ezra, Nehemiah, Ezekiel, Joshua, Haggai, Zerubbabel, Zechariah and the rest of the servants of God of that era, were all speaking of Jerusalem and the Holy Land and events that would occur in this region. The greatest Prophet of all – Jesus Christ – also spoke of endtime prophecy in terms of the Holy Land. In Matt 24, He began to speak about the Temple that was in Jerusalem, and then launched into details of various calamities, and illuminated what Daniel had said. And in the fulfillment of what Daniel had said, He issued a warning for all who are in Judea to flee at an appointed time. Well, we know where God’s House is, and Jesus went on to speak of the Master’s Household: V45-47 "Who then is the faithful and wise servant, whom the Master has put in charge of the servants in His Household to give them food at the proper time? It will be good for that servant whose Master finds him doing so when He returns. I tell you the Truth, He will put him in charge of all His possessions." Then Jesus introduces a ‘what if’ scenario: V48 "But suppose that servant is wicked and says, ‘My Master is staying away a long time,’ and he then begins to beat his fellow servants and to eat and drink with the drunkards. The Master of that servant will come on a day when he does not expect Him and at an hour he is not aware of. He will cut him to pieces and assign him a place with the hypocrites, where there will be weeping and gnashing of teeth." That servant would have to be a real fool! In fact, this parable is not speaking of one servant but of the Sons of Jerusalem who are put in charge of God’s Household. God is warning that even after years of fighting to secure the Holy Land, they should not let up and decide to build their own houses and begin living sumptuously. It has happened in the past, as attested to by the ‘minor prophets’, and God is determined that it won’t happen again. Once in a pattern of sumptuous living, they begin to compromise in order to have peace. Soldiers in the field of battle never allow themselves to become too comfortable because the fortunes of war can change in a moment. But there is another household – the Church of God. These are the Body of Christ and a holy temple to God – but only after they receive the Counsellor – the Spirit of Christ – and bear the imprint of God’s Son. God makes a clear distinction between those who think they are Christians, and those who actually are! Everyone who hopes to be in God’s Kingdom have a duty to perform. There is no gravy train to glory! The Church – the True Church of God – must keep the Commandments of God and hold to the Testimony of Jesus (and we all know what this is, don’t we? Rev 19:10), just as the prophet has said in Rev 12:17. Speaking of being in charge of God’s household, there was a similar situation when Nehemiah returned to Babylon to see the king as he promised to do, and returned. He arrived back to find Tobiah all set up in the Temple court and exercising authority over everyone. This was the one who had formerly aligned with God’s enemies to oppose the Work of God on the Holy Mountain. Perhaps some thought he was a changed man and deserved some privileges, but Nehemiah thought differently. Leopards don’t change their spots. Those who oppose God are relegated to outer darkness forever. For those who do it knowingly and willingly, there is no way back! Generally speaking, God doesn’t call weak-willed men and women to this Brotherhood who can’t remain faithful. Weak-willed people fall apart at the slightest bit of adversity and seek to blame others. In the dangerous situation that Jesus is describing, you would want to know that your fellow-servants are ready for action and prepared to do their duty. Faithful men who don’t turn back on the day of battle. When the Israelites first entered the Holy Land after their captivity in Egypt, God insisted that all able-bodied men make themselves available for battle to clear the Holy Land of His enemies and to settle each of the Tribes in their allotted territory. This was to make sure that once they had their allotments, they didn’t settle down to sumptuous living and forget about the others. If all this is so, then what about the Church of God and the Tribes of Israel? Are they peripheral to all this prophecy? Actually they are; at least in the early stages. But they are central to the final outcome. God decided long ago that the children of Jacob would form a single mighty nation comprising all the 12 Tribes. These are to inherit the Holy Land from the River of Egypt to the River Euphrates, and God has even made provision for their expansion to fill the entire earth. Of all the families on the face of the earth, God has chosen only the 12 Tribes of Israel and no other (Amos 3:1-2, Deut 7:6, 2Sam 7:22-24, Deut 14:2). The Great Creator God makes His own decisions, and all those who disagree are considered to be the children of the devil (1John 3:10). You cannot oppose God and continue to be His children! God has in mind to produce a nation in the image of His Son. He has in mind to destroy the devil and all his children and all their works (1John 3:8). God has determined that He will build a nation based on the pattern of His Son Jesus. And this has far greater ramifications than you could imagine! Earlier on, in the days of Moses, representatives from each of the Tribes (except Levi) were sent in to spy out the land and came back and reported that God’s enemies were too strong, and counseled against going in – all except Joshua and Caleb. What is more, they openly challenged Moses and even threatened to stone him. God was furious, and gave a verdict that none would go in for 40 years. Since they lacked the guts to obey Him, they would wander around in the desert for 40 years, and would die in the desert, until the new generation arose with the courage to follow God’s instructions. Joshua, an Ephraimite, and Caleb, a Jew, counseled that they were well able to do as God had commanded, and urged obedience. As it turned out, both these men survived the forty years (Num 14:30), while all others died in the desert. 1Cor 10:1 "For I do not want you to be ignorant of the fact, brothers, that our forefathers were all under the cloud and that they all passed through the sea. They all ate the same spiritual food, and drank the same spiritual drink; for they drank from the SPIRITUAL ROCK that accompanied them, AND THAT ROCK WAS CHRIST. Nevertheless, God was not pleased with most of them; their bodies were scattered over the desert. Now all these things occurred as our examples, to keep us from setting our hearts on evil things as they did. Do not be idolators as some of them were; as it is written: The people sat down to eat and drink and got up to indulge in pagan revelry. We should not commit sexual immorality, as some of them did – and in one day twenty-three thousand of them died. We should not test the Lord, as some of them did – and were killed by snakes. And do not grumble, as some of them did, and were killed by the destroying angel. These things happened to them as EXAMPLES and were written down as WARNINGS for us, on whom THE FULFILLMENT OF THE AGES HAS COME. So if you think you are standing firm, be careful that you don’t fall!" So we see here that all these things were EXAMPLES for us, and WARNINGS for those on whom THE FULFILLMENT OF THE AGES HAS COME! And just one other thing to note: The Rock accompanied them throughout all their journeys, and that Rock – their God – was Christ! It was Yahweh – the Word of God. The very One who spoke only the Father’s words: John 14:24 "He who does not love me will not obey my teaching. These words you hear are not my own; they belong to the Father who sent me. All [that] I have spoken while still with you. But the Counsellor, the Holy Spirit, whom the Father has sent in my Name, will teach you all things and will remind you of everything I have said to you." V28 "You heard me say, ‘I am going away and I am coming back to you.’ If you loved me, you would be glad that I am going to the Father, for the Father is greater than I." There is an awful lot of people who like to worship Yahweh to the exclusion of the Father – and against the Christ’s express instructions! All that Jesus spoke while still with them were the Words of the Father. Jesus was His Spokesman – and the God of Israel! The Churches of God and the House of Israel are presently engaged in sumptuous living, and have no concern for Jerusalem or God’s Holy Land. Only the Jewish people were willing to go in and take possession of it in 1948 after they had endured a horrific holocaust throughout Europe and had nowhere else to go. I certainly don’t want to downplay the courage of the Jewish people, but it took them a long time to do it, and to prepare themselves to fight for the Holy Land. They have yet to fight for the Holy City Jerusalem! Presently, infidel Moslems are trampling all over the Holy Mount and the Jews are not permitted there! Of all the people on the face of the earth, only the Jewish people (and the Sons of Jerusalem) grieve and lament for Jerusalem, the Holy City of God. No one else cares! If Jerusalem is the price that must be paid in order to have peace with the Muslim scum who now occupy it, then this is the price that Ephraim and the Church of God are prepared to pay. In the case of the Churches of God, this is the way it’s been for seventy years. Not so with the Sons of Jerusalem! With God’s sons, nothing will bar the way! These sons have been taught by God and know what is required of them. God has also revealed His secrets to them, to know the beginning to the end. They don’t shrink back from taking possession of God’s Holy Land. Nor will they forsake God’s Holy City Jerusalem. Whatever has to be done, it will be done! The extent of their obedience is made clear through the prophet Ezekiel: Eze 9:1-11 "Then I heard Him call out in a loud voice, "Bring the guards of the City here, each with a weapon in his hand (a reference to Luke 22:36-38, Isa 53:12)." And I saw six men coming from the direction of the upper gate, which faces north, each with a deadly weapon in his hand. With them was a man clothed in linen who had a writing kit at his side. They came in and stood beside the bronze altar. Now the Glory of the God of Israel went up from above the Cherubim, where it had been, and moved to the threshold of the Temple. Then the LORD called to the man clothed in linen who had the writing kit at his side and said to him, "Go throughout the City of Jerusalem and put a mark on the foreheads of those who grieve and lament over all the detestable things that are done in it." As I listened, He said to others, "Follow him through the City and kill, without showing pity or compassion. Slaughter old men, young men, and maidens, women and children, but do not touch anyone who has the mark. Begin at my sanctuary." So they began with the elders who were in front of the Temple. Then He said to them, "Defile the Temple and fill the courts with the slain. Go!" So they went out and began killing throughout the City. While they were killing and I was left alone, I fell face down, crying out, "Ah, Sovereign LORD! Are you going to destroy the entire remnant of Israel in this outpouring of your wrath on Jerusalem?" He answered me, "The sin of the HOUSE OF ISRAEL and JUDAH is exceedingly great; the land is full of bloodshed and the CITY full of injustice. They say, ‘The LORD has forsaken the land; the LORD does not see.’ So I will not look on them with pity or spare them, but I will bring down on their own heads what they have done." Then the man in linen with the writing kit at his side brought back word, saying, "I have done as you commanded." (The writer is mentioned in Ps 45:1-5, 7). You’ll recall how Jesus Himself partially fulfilled this Scripture when He drove all the men and animals out of the Temple Court with a whip. He was giving us a foretaste of the meaning of this Scripture. Jesus made it clear that it was the ‘end of the age’ (Gr: aion – Matt 24:3) when everything that is written will be fulfilled. The word ‘end’ comes from the Greek word ‘sunteleia’ and figuratively means ‘the setting of the sun’ or ‘the breaking of a union’ as in when Satan is cast down following a great battle, and the Kingdom of God is established (Rev 12:9-10), and the Sun of Righteousness arises (Mal 4:2) with healing in His wings. And in Mal 4:3 "Then you will trample down the wicked; they will be ashes under the soles of your feet on the day (dawning of a new day – see 2Pet 1:19) when I do these things," says the LORD Almighty." Here in Eze 9:9 God expands the slaughter to include the HOUSE OF ISRAEL and JUDAH and speaks of the CITY being full of injustice. Well there is no doubt that this applies to Jerusalem and JUDAH – the Jewish people, but how does the HOUSE OF ISRAEL figure in the equation? Well it seems that neither Ephraim nor Judah have fully learnt the lesson of Joshua the son of Nun (of the Tribe of Ephraim) and Caleb (of the Tribe of Judah). God didn’t instruct them to go in and take the land and then make friends with His enemies! God told them to go in and utterly slaughter them – men, women and children! No one can dispute this, because it’s all written down for our admonishment, and is an example for all on whom the ENDS OF THE AGE have come (1Cor 10:11). The CITY that is most important to Ephraim is Washington – not Jerusalem! In fact, the whole world is focused on Washington for better or worse, and Satan’s brood can’t wait to see it destroyed. God speaks of this CITY in Isa 28:1-3 "Woe to that wreath, the pride of Ephraim’s drunkards, to that fading flower, his glorious beauty, set on the head of a fertile valley – to that CITY, the pride of those laid low by wine! See, the LORD has one who is powerful and strong. Like a hailstorm and a destructive wind, like a driving rain and a flooding downpour, he will throw it forcefully to the ground. That wreath, the pride of Ephraim’s drunkards, will be trampled underfoot." If God is going to deal with Jerusalem – the City He loves – in this manner, how could the pride of Ephraim’s drunkards – that CITY of Washington escape? Since Ephraim is the prince among his brothers, God will hold them doubly accountable. Generally, it’s God’s way not to bring disaster while the House of Israel has a righteous ruler. A righteous ruler can bring a lot of favour with God. God will defer disaster as long as the ruler of His people responds to His righteousness. When the House of Israel goes into battle, they still go as ‘the armies of the Living God’ as they did in the days of Moses, and in the days of David. But the fortunes of war can change in a moment, just as they frequently did anciently (again note the account of Moses holding up his arms). God doesn’t permit cowardice in the face of the enemy when God’s armies march out in His Name. There was a moment during the war in Iraq when Central Command (Centcom) announced a three to six day ceasefire of activities at the very gates of Baghdad – where Satan’s throne is! This hesitation was enough to bring disaster, and Almighty God stood ready to do it. But the whole nation of Ephraim (and the whole House of Israel for that matter) was averted from immediate destruction by the efforts of one man – the President of the United States! He roared from the White House in Washington, and Centcom backed down from their resolve and immediately advanced. It was the defining moment. And it was also the moment when the left-wing loonies became most vocal in their efforts to stop the war. The Wailing Wall (foreground) and the Dome of the Rock (top). King David was an exceptionally righteous man, and God loved him dearly. Yet David’s life was one of continual battles against the foes of God. It seems that war never ended during his reign, but his resolve to wipe out God’s enemies never waned. His efforts have found great reward in that he will rise from the dead to be king over all Israel once more. God determined to spare his son the agony of war out of His love for David. Furthermore, God gave David’s son Solomon Wisdom, wealth, power and prestige in the eyes of the whole world. God loved Solomon very much also, and spared him nothing including peace during his reign. There is only one criticism in the Bible concerning Solomon. It wasn’t his many wives and concubines that caused him to sin, it was the practices of these women – which he eventually chose to follow: Neh 13:26 "Was it not because of marriages like these that Solomon king of Israel sinned? Among the many nations there was no king like him. He was loved by his God, and God made him king over Israel, but even he was led into sin by foreign women. Must we hear now that you too are doing all this terrible wickedness and are being unfaithful to our God by marrying foreign women." It’s hard to imagine why any God-fearing person would want to marry a pagan woman. But one small caveat here! A woman of a foreign nation is not considered a foreigner as long as she lives according the Laws of God that He gave to all Israel. Then she becomes a grafted Israelite. Where Solomon made his mistake was in allowing his foreign wives to practice their pagan religions and to entice him to do the same. This is what displeased God; it was not because he had many wives. His father David had several wives, but didn’t fall into the same trap. It was of course Solomon who built the Temple of God – the most magnificent of structures, and no expense was spared. His father David had instructed him, and he did it with Wisdom and dedication and in great detail. The Jewish people have been speaking of building the Third Temple for years now. But there is a major problem! 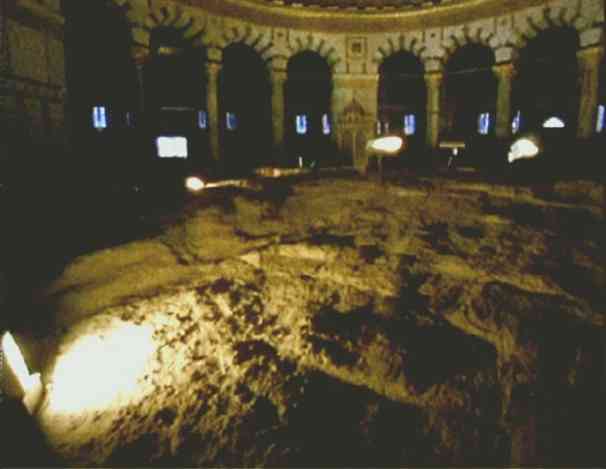 There is a Moslem mosque over the Rock, the site of the Holy of Holies, and it must be removed before the True Temple can be built. This mosque has been standing there for over a thousand years, and God is well aware of it. Long before it was built, God made plans to remove it. And God has reserved the prerogative to do it. It must not be done with human hands, but it will be done when Zerubbabel returns from captivity, and it will be done in his presence. Zerubbabel is the prince of Judah, and the man who stands as Zerubbabel in the endtime prophecies will come in the same spirit. The first Zerubbabel is both dead and buried, so the prophecies are not speaking of his physical resurrection. Rather, it’s a Jewish man, of the line of David, who will come in the spirit and power of Zerubbabel in much the same way as John the Baptist came in the spirit and power of Elijah. We all know that John the Baptist, whom Jesus said was Elijah, was born of a woman. This is no great mystery that God calls men of this present era to emulate the prophets of old. There was a time when Jesus asked His disciples who people thought He was: Matt 16:13-14 "When Jesus came to the region of Caesarea Philippi, He asked His disciples, "Who do the people say the Son of man is?" And His disciples replied, "Some say John the Baptist, others say Elijah, and still others Jeremiah or one of the prophets." The people had no trouble believing He was one of the great prophets of old. Even the Scribes and Pharisees believed that. They objected to Him calling Himself the Son of God. The truth is that Jesus nearly always called Himself the ‘Son of man’. It was God the Father who said, "This is my Beloved Son in whom I am well-pleased", and He said it in their presence (Matt 3:7), and in V17 "And a voice from heaven said, "This is my Beloved Son , whom I love; with Him I am well pleased." The voice from heaven came from the Majestic Glory (2Pet 1:17), the dwelling-place of God. Then Jesus asked His disciples: V15 "What about you?" he asked, "Who do you say I am?" Simon Peter answered, "You are the Christ, the Son of the Living God." It’s interesting isn’t it? The Words of the Father and the Son mean nothing if they conflict with the opinions of men! Both Jesus and John the Baptist declared wonders that had never been known before. They confounded the religious hobbyists of their time even though the religious leaders knew the Scriptures almost by heart, but they never understood them. The same is true today. My favourite question for all these self-righteous fools is, "What is the meaning of Isa 40:3-5 and Luke 3:4-6?" If they don’t know the answer, then they don’t understand the Scriptures. And they don’t understand the Scriptures because God has not revealed His secrets to them. And if God has not revealed His secrets to them, then they don’t have the Testimony of Jesus (Rev 19:10). No-one condemns another for being ignorant, but if that person chooses to remain ignorant, then his only reward is in this life. God makes this clear when He says, "My people are destroyed for lack of knowledge." God decides to whom He will reveal His knowledge. I have yet to meet any proud and arrogant person who ever grew in grace and knowledge. Some of the worst displays of arrogance come from religious people. The best example is the Scribes and Pharisees of Christ’s time. They were a stench in His nostrils. Their holier-than-thou attitude almost makes one’s flesh crawl. Is God capable of reproducing one of the prophets in someone else born of a woman? Well, the One who became the Christ certainly was reproduced in the flesh and was born of a woman. The man Jesus was the same Being that formerly resided with the Father. There is a spirit in man, and when he dies it can go up to God or downwards into the pit. God has the spirits of all the prophets ready to reproduce them back to flesh, and all of these who live on earth in the future will have the appearance of fleshly human beings, even though they will be spirit beings. Spirit beings have the ability to materialize or de-materialize at will. Solomon was a very wise man and made some very wise observations: Eccl 3:18 "I also thought, "As for men, God tests them so that they may see they are like the animals. Man’s fate is like that of the animals; the same fate awaits them both. As one dies, so dies the other. All have the same breath (or spirit); man has no advantage over the animal. Everything is meaningless. All go to the same place; all come from the dust, and to dust all return. Who knows if the spirit of man rises upward [or] if the spirit of the animal goes down into the earth?" Solomon makes it sound almost depressing. What he is saying here is that the spirit of man is the pattern of the man, in a similar fashion to that of the animals. Both go to the same place – dust! But then he poses the question, "Who knows if the spirit of man goes upward [or] if the spirit of animal goes down into the earth?" As he says, all have the same breath or spirit and man has no advantage over the animal. So in this context, both share the same fate! And this is the way it would be except for one thing – the resurrection from the dead. There were two schools of thought among the Pharisees and the Herodians (Sadducees). One believed in the resurrection - the Pharisees, and the other didn’t – the Herodians (Acts 23:8). Though, they seemed to believe that Jesus was Jeremiah or one of the former prophets come back to life again! Herod and his bunch (the Herodians) believed that Jesus was John the Baptist come back to life, yet they didn’t believe in the resurrection in bodily form. They believed only that the spirit of John the Baptist had descended on Jesus, and that Jesus had become him. Since both Jesus and John were of the same age, and both had been born of a woman, there were no question of any resurrection – and even the Herodians knew this! But Herod assumed that somehow John had become Jesus: Mark 6:14 "King Herod heard about this, for Jesus’ name had become well known. Some were saying, "John the Baptist has been raised from the dead, and that is why miraculous powers are at work in him." Others said, "He is Elijah." And still others claimed, "He is a prophet, like one of the prophets long ago." But when Herod heard this, he said, "John, the man I beheaded, has been raised from the dead." It shows how muddled in the mind Satan’s agents can be! The smallest amount of inquiry would have established that John was not Jesus in a bodily, resurrected form. Oddly enough, Herod was not that wide of the mark, but had no idea of the real answer. In the account in Luke 9:7-9, we are told that Herod wanted to see and speak to Jesus. But this wasn’t to be! Jesus had to fulfill the Scripture that says He went silently as a lamb to the slaughter, and after his arrest, in Herod’s presence – the ruler of the heavenly realm, ‘Jesus gave him no answer’ (Luke 23:8-9). He spoke freely in the presence of Pontius Pilot though, and even admitted that He was a king, but added that His Kingdom ‘was not from hence’ (John 18:36-37 – KJV). His Kingdom was not from that time! It’s at the time (the period or era) of the Seventh Trumpet when all the kingdoms of this world become the Kingdom of the Lord and of His Christ (Rev 11:15). Even Daniel confirmed the timing of this in Dan 2:44-45. It’s this world, this terra firma, that will become the Kingdom of God – but not until the appointed time – and that is many years hence. Jesus made the point that He and His followers were not of this world: John 17:13 "I am coming to you (the Father) now, but I say these things while I am still in the world, so that they may have the full measure of my joy within them. I have given them your Word and the world has hated them, for they are not of the world any more than I am of this world. My prayer is not that you take them out of the world, but that you protect them from the evil one. They are not of the world, even as I am not of it. Sanctify them by the Truth; your Word is Truth. As you sent me into the world, I have sent them into the world. For them I sanctify myself, that they too may be truly sanctified." If you want to stretch the truth and claim that Jesus was talking about another dimension, and there is another dimension – it’s called the heavenly realm – of spirit beings, but then you would have to believe that the disciples were no longer human but spirit beings, because they were still living in the world, even though they are not a part of it! But the Kingdom of God was not for that time or place. Jesus was speaking of the here and now rather than the hereafter when He said that His Kingdom was not of this world. In the Book of Revelation we learn when the kingdoms of this world become the Kingdom of our Christ (Rev 12:10) and the rescue will begin. Then God’s servants will fight! But first they must secure the Holy Land by driving out all the foreigners – the children of Satan. God intends for the whole world to know who owns that Land! Jesus said that if His Kingdom were of that time then His servants would fight. For those who think the Kingdom of God will not be on this earth, or even of this universe (cosmos) would have to believe that His servants are going to fight somewhere beyond this universe. 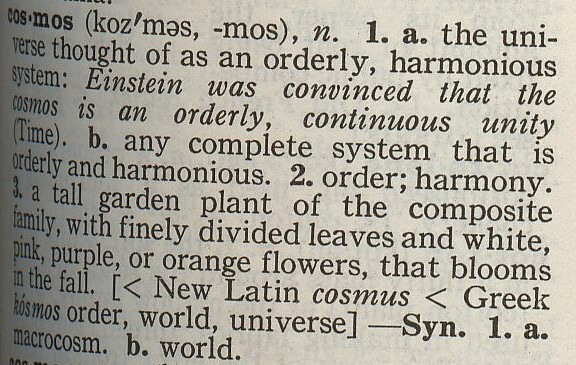 Kosmos or Cosmos. It’s prime meaning is ‘universe’. Einstein however, related it to time. This will really add to the confusion of the feeble-minded. When people who don’t have God’s Holy Spirit begin to proof-text the Scriptures to confound the meaning – usually to support their own diminutive views – they run into all sorts of problems! How do their crazy ideas stack up against these verses: Heb 1:1 "In the past God spoke to our forefathers through the prophets at many times and in various ways, but in the last days He has spoken to us by His Son, whom He appointed heir of all things, and through whom He made the universe (Gr. aion)". Right away we have a strange situation here. Some of the translators use the word ‘worlds’, some ‘universe’ meaning ‘cosmos’, and the Greek scribes and translators used the word ‘aion’ meaning ‘ages’. How could there be such a wide variety of views? It becomes even more complicated in V10 "In the beginning, O Lord, you laid the foundations of the earth and the heavens are the work of you hands." Here ‘the earth’ is translated from the Greek word ‘ghay’ (Str. 1093), and ‘the heavens’ are translated from the word ‘ouranos’ (Str. 3772) meaning ‘everything above the earth’. The foundations are translated from ‘themelioo’ meaning ‘ground’ (Str. 2311). Heb 1:10 is a direct quote from Ps 102:25-27 (start reading at V18) which some of the scribes and translators apparently failed to recognize, because if they had, they would have known what Heb 1:1 meant, and would have translated it accordingly. It’s a fact of life that those who argue most strenuously for a point of view are those least able to follow any form of logic. God hates doubters and scoffers! He never calls anyone to service who refuses to believe Him! In John 18:36 it would have been better if the root word ‘komizo’ (Str. 2865) had been used instead of ‘cosmos’ (Str. 2889) even though most people are taught from childhood that heaven is beyond this universe. It seems the scribes translated some words according to their own ideas with no regard for consistency, and the English translators followed suite and did the same. The Truth is that God’s heaven and the Glory are very close, so close in fact, that human beings look like grasshoppers: Isa 40:21 "Do you not know? Have you not heard? Has it not been told you from the beginning? Have you not understood since the earth was founded? He sits enthroned above the circle of the earth, and its people are like grasshoppers. He stretches out the heavens like a canopy, and spreads them out like a tent to live in." There’s a bit of irony in this Scripture, which is evidenced in the first four sentences, and which is designed to ridicule stupid people who see the Scriptures through a drinking straw. They hate God’s Truth so much that they seize on an excuse to ridicule His Word and apply a totally different meaning. When it comes to understanding Truth, apparently the translators are right, but God is wrong. (Incidentally, Isa 40 is where John the Baptist began his ministry – see V3). The Book of Hebrews was written to Hebrews, and was written in Hebrew originally, then translated into Greek, Latin, Aramaic, and after the original manuscript had turned to dust, it was translated into English. In many ways, the translators were so inconsistent in their choice of words that they have clouded the meaning for the unwary. How ‘age’ (aion) became ‘universe’ (kosmos) in Heb 1:1 is anyone’s guess, but what it does show is that the translators and the scribes were rarely consistent, mainly because they never understood the Scriptures. However, God did say that He has spoken through the prophets at many times and in various ways (Heb 1:1), and has confirmed that He will do nothing except He reveal His Plan to His servants the prophets (Amos 3:7). It’s the prophets – those who have the Testimony of Jesus (which is the Spirit of Prophecy – Rev 19:10) who conduct God’s purpose and His message on this earth. And contrary to the views of those who argue against the Holy Word, God is not revealing anything to anyone else! God has appointed prophets and prophetesses to reveal His Plan, and God speaks through them as they speak according to God’s Word. They alone of all the people on the face of the earth are imbued with the Counsellor – the very Spirit of Christ – just as the prophets of old were also (1Pet 1:11). I take no responsibility for the errors of scribes or translators, and neither do I have any regard for those who wrest the Scriptures to their own damnation (2Pet 3:16). The scribes and the translators were not able to corrupt the Scriptures that Christ used to the same degree, because there were too many keepers of these Scriptures (Rom 3:1-2) and they realized they wouldn’t get away with it! The Jewish people are trustworthier than Gentiles. These Scriptures speak again and again of the time of the end! And none of them are speaking of another universe! The problem of so many differing translations of the Bible – and all versions have significant differences even though most claim to be translated from the original manuscripts – arises from the men who performed the work. Most of them subscribed to some form of life in the hereafter, and most thought that heaven was the place that all would end up – some directly, and some through a more circuitous route (hades, perdition, torment in hell). Since over 99% of all Christians subscribe to these views, any new translation of the Bible would not be very popular with the masses if it implied anything else. So the translators were practical enough to know that they must shave a little here and add a little there to reflect the beliefs of the buyers of their version. Most were careful not to be too radical, but all chose different wording to reflect the very same passages. So which version is absolutely accurate? The truth is that none of them are, but some of them more closely resemble Truth than others. There was another problem that arose in the second century of this era, and that was the accusations against Judaizers – those who keep the Commandments of God. Gentile Christianity began to spit their venom against these Commandment keepers and referred to them by the epithet of ‘Judaizers’. Consequently, the Gentiles got a toehold in Christianity, and made true Christians the enemy. Their success is evident today, since most of Christianity doesn’t obey the Ten Commandments. In later years the translators realized that any translation must accommodate both groups, but with greater emphasis on support for mainstream Christianity. But this wasn’t possible since the whole Bible would have to be rewritten – but it was in their power to obscure the issue and make it possible for those willing to proof-text the Scriptures to justify themselves. And these people will take a single verse which may contradict a thousand others verses (thanks to deceitful and incompetent translation by the translators), and this becomes the central plank of their doctrine – usually ‘freedom’ from God’s Law! There are even some who believe that there will be no humans on earth anymore. Not only will there be human beings, but they will live to a ripe old age, and then they will die. Isaiah spoke of it in chapter 11, but Isaiah also spoke of other associated things in this chapter: Isa 11:1-3 "A shoot will come out of the stump of Jesse; from his roots a Branch will bear fruit. The Spirit of the LORD will rest on Him – the Spirit of Wisdom and of understanding, the Spirit of Counsel and of power, the Spirit of Knowledge and of the fear of the LORD – and He will delight in the fear of the LORD." Well, we all know that this is speaking of Jesus Christ – the son of David. What we don’t find today are those who bear His Name – Christians – delighting in the fear of the LORD! They seem to be a cosmos away from emulating Jesus. Not so the Levite Brotherhood! These are described thus: Mal 3:16 "Then those who feared the LORD talked with each other, and the LORD listened and heard. A Scroll of Remembrance was written in His presence concerning those who feared the LORD and honoured His Name. "They will be mine," says the LORD Almighty, "in the day when I make up my treasured possession. I will spare them, just as in compassion a man spares his son who serves him. And you will see again the distinction between the righteous and the wicked, between those who serve God and those who do not." Obviously, those who serve God do not serve His enemies! All those who serve the LORD Almighty are like His Son who delights in the fear of the LORD. God’s servants literally quake before the Almighty God and tremble at His Word! They believe everything God has said, and they have the Spirit of Wisdom and of understanding, the Spirit of Counsel and of power, the Spirit of knowledge, and they fear the LORD – just like Christ! And as the Father says, soon you will see the distinction between the righteous and the wicked – and that distinction will be between those who serve Him and those who don’t! God has no interest in those who don’t serve Him faithfully and with fear, and those who don’t are the wicked. Continuing in Isa 11:3-5 "…He will not judge by what He sees with His eyes, or decide by what He hears with His ears; but with righteousness He will judge the needy, with justice He will give decisions for the poor of the earth. He will strike the earth with the rod of His mouth; with the breath of His lips He will slay the wicked. Righteousness will be his belt and faithfulness the sash around His waist." What you see and hear today among this world’s religious pretenders is not God’s righteousness, and if you relied on the opinions of men, you would soon find yourself at odds with God. God’s Word is Truth, and His Way is righteousness. Remember, God makes the rules! The Mighty Christ says He will slay the wicked. By what means? Christ the Word will judge according to the Word – the written Word – the Scriptures and the Scriptures make clear the means! God makes it clear that judgment begins in the House of God – the House of Israel. And He also makes it clear that God’s servants will have some of the power of Christ: Hos 6:4 "What can I do with you, Ephraim? What can I do with you, Judah? Your love is like the morning mist, like the early dew that disappears. Therefore I cut you to pieces with my prophets, I killed you with the Words of my mouth; my judgments flashed like lightning upon you. For I desire mercy and not sacrifice, and acknowledgment of God rather than burnt offerings. Like [all men] they have broken the Covenant – they were unfaithful to me there." In continuing, Isaiah describes the Holy Land when God’s Kingdom is established: V6 "The wolf will lie down with the lamb, the leopard will lie down with the goat, the calf and the lion and the yearling together; and a little child shall lead them. The cow will feed with the bear, their young will lie down together, and the lion will eat straw like the ox. The infant will play near the hole of the cobra, and the young child [will] put his hand into the viper’s nest. They will neither harm nor destroy on all my holy mountain, for the earth will be full of the knowledge of the LORD as the waters cover the sea. In that day the Root of Jesse will stand as a banner for the peoples; the nations will rally to Him, and His Place of Rest will be glorious. In that day, the Lord will reach out His hand A SECOND TIME to reclaim the remnant (of Israel – see Paul’s reference in Rom 9:27) that is left of His people from Assyria, from Lower Egypt, from Upper Egypt, from Cush, from Elam, from Babylonia, from Hamath and from the isles of the sea (notice that Islamic nations are identified). He will raise a banner for the nations and gather the exiles of Israel; He will assemble the scattered people of Judah from the four corners of the earth." If you think the whole House of Israel is going to throw up their hands and acknowledge the Mighty Christ the day after He arrives, then you are deluded! The Holy Mountain and Jerusalem will be well established, with children being born, and the wild animals tamed, and all the while, most of the House of Israel will still be in captivity. First the nations of the earth have to be subdued, and the lightning flashes of God’s weapons (see Hab 3:11-12, Ps 7:13) will help them to this end. Then the whole world will know, and the House of Israel in particular, what it means to fear God! In the interim, however, the Kingdom of God will be forcefully advancing just as Jesus said, and violent men will take it by force. I still get bombarded with emails from people who insist that God’s Kingdom will not be on this physical earth, and yet they also insist that the Kingdom of God was established when Christ walked the earth. Their arguments are made even more stupid when we find in Rev 21:3 that God the Father will dwell with men on earth. In the next verse, God says He is making everything new. The landmass of the earth will be purified with fire and restored to its previous form, when it had an exact form, but became formless and voided (broken up). Peter spoke of this in 2Pet 3:10-12. God’s Day, the Seventh millennial Day, will bring massive changes to everything – just as John the Baptist said in Luke 3:4 "As it is written in the Book of the words of Isaiah the prophet, "A voice of one calling in the desert, ‘Prepare the Way for the Lord, make straight paths for Him. Every valley shall be filled in, every mountain and hill made low. The crooked roads shall become straight, and rough ways smooth. And all mankind will see God’s salvation.’" John was quoting Isa 40:3-5. This statement is probably one of those that fascinated Herod about John’s teachings. He wanted to know more. Herod was just like all those who hate God’s Truth and want to corrupt it to suit their own perceptions of everything. Such people are a part of this world, Satan’s world, of which the Apostle John warned against in his writings. God’s people consider themselves to be aliens and strangers in this earth (Heb 11:13-14) until God’s Kingdom and country is established. Christ referred to the heir of Herod’s dynasty as a fox or jackal or a wild dog: Luke 13:32 "He replied, "Go and tell that fox [jackal], ‘I will drive out demons and heal people today and tomorrow, and on the third day I will reach my goal. In any case, I must keep going today and tomorrow and the next day – for surely no prophet can die outside of Jerusalem." (Jesus was letting Satan and his agent jackal know that they would kill Him in Jerusalem. Both prophets of that era or time-frame, John the Baptist and Jesus, were killed in Jerusalem.) The intended meaning of foxes and jackals is preserved in Rev 22:14-16 "Blessed are those who wash their robes, that they may have the right to the Tree of Life and may go through the gates and into the City. OUTSIDE ARE THE DOGS [or jackals], who practice magic arts, the sexually immoral, the murderers, the idolators and everyone who loves and practices falsehood. I, Jesus, have sent my angel to give you this Testimony for the Churches. I am the Root and the Offspring of David, and the Bright Morning Star." Generally speaking, most of the modern translations preserved the meaning of the Book of Revelation without too many alterations. Perhaps they took very seriously the warning in Rev 22:18. It’s all the other Books of the New Testament, although all were translated into a common language – English, tend to differ so much in meaning. If the English translations differ so much in our era, then it’s obvious that other translations from one language to another also suffered from differences and nuances common to the different languages. This doesn’t however, excuse those who like to proof-text with a single word – and who like to ignore everything God has said in order to enforce their own ideas and agendas. It should also be pointed out that the first four Books of the NT (usually called ‘the Gospels’) were written by four different men, two of whom were Apostles, and all four wrote about what they considered important at the time. Consequently, there are additions, variations and omissions in them all, but this doesn’t detract from the importance of the message. It’s a pity that John Mark decided to give his account, since he was only a young kid when the things he wrote about occurred, and consequently, he wasn’t as thorough in preserving accuracy. Luke was extremely careful to preserve accuracy: Luke 1:1-4 "Many have undertaken to draw up an account of the things that have been fulfilled among us, just as they were handed down to us by those who from the first were eye-witnesses and servants of the Word. Therefore, since I myself have carefully investigated everything from the beginning, it seemed good also to me to write an orderly account for you, most excellent Theophilus, so that you may know the certainty of the things you have been taught." As Luke says, ‘Many have undertaken to draw up an account’, so there may have been hundreds of other accounts of this period written too, by others, but these were never canonized (fortunately). It’s particularly fortunate that the gospel of Thomas hadn’t been written when the canonization occurred two or three hundred years after the events of Christ. The gospel of Thomas might as well have been that of Thomas Beckett for all the good it is – like ‘the Illiad wasn’t written by Homer, but by someone of the same name’. But how emotionally-corrupt Christianity would like to include the spurious Thomas’ gospel in the canonization! Then they’d really have something to sob about. If you read the accounts of war or history as detailed by opposing sides, you will note significant differences in their accounts. No one is seeking Truth, most are obfuscating it to uphold their own ideals and purposes. The same is true of the Christian religions, all of whom have their own particular axe to grind. The classic case was Saddam Hussein claiming victory after ‘Desert Storm’ in 1992. From time to time, the news channels carry a story of the address of a leader in a foreign language, and supply their own interpreter to translate. It’s always interesting to hear the different interpreters translate the same words, and yet differ so much in meaning and choice of words. The classic example of this was an address by Vladimir Putin of Russia. The problem is the Russian language. It has all the adjectives and nouns at the beginning of each sentence, and the verb at the end. In a long sentence in Russian, the conjugation of the verb can almost pass from short-term memory before the verb is known. This is why you hear long pauses from the translators when translating Russian. They have to wait until the sentence is finished to know the intended meaning. Whether Russian, Arabic, Urdu or any other language, there is no absolute consensus on what was said. It’s even worse with Far-Eastern oriental languages where the whole meaning of a sentence can change just by voice inflections. As for understanding the meaning of the various translations, it becomes necessary to understand the broad parameters of God’s word. If something obviously contradicts something else in the Scriptures, then you can be sure that the translators have either misunderstood or have been unable to come to a consensus of the meaning of the vast array of early transcripts. The fault was not always with the translators because many manuscripts differ so much in meaning and wording that it became a difficult task to determine the right meaning. Perhaps the single, most unclear chapter in the whole Bible is Genesis one. It just happens to be the one that has caused the most controversy in two opposing camps. If you read the account of Genesis chapter one, you will note that there is no reference to God shaping the landmass of the earth. The account merely says He uncovered the landmass by dividing the waters: Gen 1:9 "And God said, "Let the water under the sky be gathered in one place, and let dry land appear." And it was so. God called the dry ground "land" and the gathered waters He called "seas". And God saw that it was good." This falls way short of the accounts of Pro 8 and Job 38:4. The 8th chapter of Proverbs clarifies a lot of things: Pro 8:22 "The LORD possessed me at the beginning of His Work, before His deeds of old; I was appointed from eternity, from the beginning, before the world began. When there were no oceans, I was given birth, when there were no springs abounding with water; before the mountains were settled in place, before the hills, I was given birth, before He made the earth or its fields or any of the dust of the world. I was there when He set the heavens in place, when he marked out the horizon on the face of the deep, when He established the clouds above and fixed securely the fountains of the deep, when He gave the sea its boundary so that the waters would not overstep His command, and when He marked out the foundations of the earth. Then I was the Craftsman at His side." (The Craftsman mentioned here is the same One who was at God’s side when they discussed making man – ‘Let US make man in OUR OWN IMAGE’. See also Pro 8:31). In the Genesis account, the waters had already overstepped His command, and immersed the landmass. God had to recede the waters and dry out the land. In the Book of Genesis, there is no mention of shaping or marking-out the landmass at all, but only that the landmass appeared through the water. (As a matter of fact, Peter mentions the seas and the landmass, and says "they deliberately forget" in 2Pet 3:5. He then goes on to describe the new earth, when the earth will be laid bare. I could explain exactly what Peter meant and what he says that people "deliberately forget", but it would take a very long explanation, so you’ll have to work it out for yourselves.) Some people deliberately forget, while others simply cannot retain knowledge. I wonder why? (Luke 8:12). When Satan fields an agent to attack the Testimony of Jesus, you can be sure that he is not interested in Truth, and ignores it, brushing it aside. Instead they choose to attack with proof-text, and trick questions, just as they did in Jesus’ day. And no answer suffices for Satan’s agents! God makes it even clearer when He speaks to Job. The very first thing that God does is to bring to mind the origins of the earth: Job 38:4-7 "Where were you when I laid the earth’s foundation? Tell me, if you understand. Who marked off its dimensions? Surely you know! Who stretched a measuring line across it? On what were its footings set, or who laid its cornerstone – while the morning stars sang together and all the angels shouted for joy?" This was the time when the two morning stars (Isa 14:12 and Rev 22:16) sang together in perfect harmony. This was not the case, however, in the first week of the re-creation of the earth. The serpent, who is the devil and Satan (Rev 12:9), was right there opposing the Creator and trying to corrupt the creation. There was no harmony and no singing. V8 "Who shut up the sea behind doors when it burst forth from the womb, when I made the clouds its garment and wrapped it in thick darkness, when I fixed limits for it and set its doors and bars in place, when I said, ‘This far and no farther; here is where your proud waves halt’?" It’s clear that God is speaking of a time prior to the Genesis account when the ocean had already exceeded its boundary and inundated the landmass. God’s account here is that He created the landmass and stretched a measuring line across it, and then brought forth the sea from the womb. It’s fitting that Wisdom, who was at God’s Side as the Craftsman, should reveal these things. It’s also fitting that those who don’t have the Testimony of Jesus cannot understand them. And of course, it’s also fitting that Wisdom, the Craftsman, the Christ, is also the chief Cornerstone which was referenced by God in His dialogue with Job. He is represented by the upper Rock of the pyramidal shape of the earth: Eph 2:20 "Consequently, you are no longer foreigners and aliens, but fellow-citizens with God’s people and members of God’s household, built on the foundation of the apostles and prophets, with Jesus Christ Himself as the Chief Corner Stone." And He is also described as the Living Stone: 1Pet 2:4 "As you come to Him, the Living Stone – rejected by men but chosen by God and precious to Him – you also, like living stones, are being built into a spiritual house to be a holy priesthood, offering spiritual sacrifices acceptable to God through Jesus Christ. For in the Scripture it says: "See, I lay a stone in Zion, a chosen and precious Cornerstone, and the one who trusts in Him will never be put to shame." Now to you who believe, this Stone is precious. But to those who do not believe, "The Stone the builders rejected has become the Cornerstone." Almost forty years ago I sat in a congregation and listened to a preacher trying to explain the meaning of ‘spiritual sacrifices’, as mentioned by Peter in these verses. He concluded by saying that it meant the daily trials and problems. In view of the rest of the Scriptures, it sounded stupid to assume that the things that are common to, and which befalls all men, could represent ‘spiritual sacrifices’. And so it became commonplace to consider such things as a flat tyre on the way to Sabbath services to be, (sniffle) a spiritual sacrifice. It demonstrates the ease with which men can corrupt the Truth. Just imagine if this preacher had explained that a ‘spiritual sacrifice’ is the fulfillment of the meaning of animal sacrifices – just as Jesus represented the sacrificial lamb going to the slaughter. The stampede might have caused a dust storm. Generally speaking, Christianity doesn’t want to have to earn a reward; they want the rewards for doing nothing. And spiritual sacrifices are not high on their agenda! It seems that this spiritual Law has been prorogued by them and replaced by something that has greater appeal. The fact that Christianity has gotten things so wrong is evidenced in the account where the Vatican persecuted Galileo because he said the earth was round. Galileo wasn’t the first to propose this! Copernicus had already established a following through his book, which detailed a lot of truth to which mainstream Christianity was oblivious. The Biblical ancients knew the earth was round just like the moon they so regularly saw. The fact that God speaks of the circle of the earth meant nothing! The Vatican wanted to be the final authority on everything Christian, and couldn’t stand it when someone stated the obvious. They felt that Galileo and others had prorogued their right to determine natural laws and were deeply affronted by it. Nothing much has changed. Even today, mainstream Christianity still has their foibles, where they prefer to believe the opinions of men rather than the Writings of God. Consequently, the only Scripture that existed at the time of Christ is no longer considered by most to be Scripture and worthy of reproof, correction and instruction in righteousness (2Tim 3:16). Jesus and the Apostles often quoted the only Scriptures available at that time. Did they always quote them verbatim? You will find they didn’t! Rather, they quoted them to impart the real meaning. It’s amusing to observe those who slaver over a single word in the Scriptures without ever understanding the meaning behind it. They like to quote the ‘original’ Hebrew or Greek to show they’re right, but seem oblivious to the radical changes the original languages have undergone. For that matter, which ‘original’ manuscripts are the most authoritive? There are thousands of them, which were copied by thousands of scribes, and each of them has significant differences. Each reflects the dialect of the time, and some manuscripts are hopelessly wrong in many things. Those who have translated the modern translations of the Bible sought to come to a consensus of what was formerly written by examining the many differing manuscripts. Some of the early manuscripts that were translated from those existing had thousands of differences even to those manuscripts that were contemporary with their own. Some modern translations, such as the New International Version, sought to preserve the consensual meaning of the majority of manuscripts, and endeavoured to preserve key phrases. Some others did the same, but failed in the importance of these key phrases, which link the Scriptures together. For anyone to suggest that any translation is totally accurate and preserves the exact wording of the original, is ludicrous. The perfect example of willful and unauthorized additions is found in John 7:53-8:11. This is the account of the prostitute that was taken in adultery, and to whom Jesus allegedly said, ‘Go and sin no more’. It might be a cute little story, and one that has been exhaustively quoted by every self-righteous bonehead for centuries, but it is not in any of the most reliable manuscripts! It just isn’t there! It was added by someone centuries afterwards, and has been included ever since. Like it or not, the story is a fake! And fake stories don’t benefit anyone! It seems that Peter gave a warning about this type of thing in 2Pet 2:2 "Many will follow their shameful ways and bring the Way of Truth in disrepute. In their greed, these teachers will exploit you WITH STORIES THEY HAVE MADE UP. Their condemnation has long been hanging over them, and their destruction has not been sleeping." Religious people are famous for making up cute stories for glossing over the harsh reality of what God has said. Some translations, like the NKJV, refer to these cute little made-up stories as destructive heresy! I would have to agree. They don’t benefit anyone in the least. The purpose of the Scriptures is not to reduce people to sniveling, sobbing miscreants, who have ‘seen the light’ and have ‘brought Jesus into their hearts’. The purpose of the Scriptures is to convince people that God wants them to be strong and courageous, and to follow Jesus’ example of obeying God in the most extreme of human hardship. It has nothing to do with leaping on the gravy train to glory. Could anyone imagine these emotional wimps becoming kings and priests of the Almighty God? How would they control the nations with a rod of iron if they can’t control their own feeble, human emotions? The one thing you don’t see in the cute stories of these emotional wrecks is any reference to obedience to God. The central theme of the entire Bible is OBEDIENCE TO GOD! And the perfect example is Jesus who was obedient even in the face of death. Did God create the earth ‘In the beginning’ or ‘In a beginning’ or was it ‘In beginning, God created the earth’? None of the earliest and most reliable manuscripts can agree. In the account of Genesis chapter one, did God create the earth or did He re-create the earth? Again the earliest and most reliable manuscripts differ. The difficulty was in deciding what ‘tohu’ and ‘bohu’ meant. Did it mean ‘chaotic and confused’ or did it mean ‘without form and void[ed]’? No one can agree. Either way, it indicated that everything was not perfect as one would expect from a brand-new creation. Did the Spirit of God move across the waters brooding because God was about to create the earth, or because of the chaotic mess it observed? Or was the Spirit of God just hovering or brooding for no apparent reason? The first description of the earth in Gen 1:2, before God gave the command for light, was a planet covered with water, which His Spirit brooded over or hovered over, with no light reaching its surface. Then God commanded the light to reach its surface (V3-4), and began the rotation of the earth to give night and day (V5). So the sun was already there! He called the light ‘day’ and the darkness ‘night’ just as we do today. This was the first day. On the fourth day, God determined to give the earth seasons by orbiting the earth around the sun, and for the moon to orbit the earth in order to mark seasons and days and years (V14-19). God had already made the sun, moon and stars, and by the omission of a single word ‘had’ the translators imply confusion on God’s part as to the correct order of this creation: V16 "God [had] made two great lights – the greater light to govern the day and the lesser light to govern the night. He [had] also made the stars." Since God had already created the sun, the day and night as we know it were already functioning from V2 onwards, there remained only to begin the orbit of the earth around the sun to create the seasons and years. With the application of a little bit of intelligence, the Vatican should have known that the sun didn’t orbit around the earth when they brought their false accusations against Galileo. Similarly, people should understand that God doesn’t make mistakes in what He says and does. Human beings, however, are famous for it. Today we have people who think they can proof-text the meaning of the Bible by referring to a single word in Hebrew or Greek used by one of thousands of the ancient manuscripts, and claim to have it right. In the LXX translation, there were 72 men labouring over all the manuscripts trying to determine which ones were accurate, and endeavouring to transcribe a text on the accurate consensus of the majority, but ran into difficulties. Big decisions had to be made because the majority was not always right. The LXX translators, said to be six members of each of the Tribes of Israel, sought to determine accuracy from a consensus of the Scriptures rather than the consensus of men. To do this, they had to align what the many Scrolls of Scripture had to say on any given subject, and to accurately reflect it from this degree of consensus. But again, when you put 72 men together in one room, even the meaning of the Scriptures are not consensually ascertained. So there were compromises, but mainly on alternate wording, which was forced on them by the differing languages and dialects. So who has the right to determine the Truth according to God’s intentions? Did God leave it up to the individual to do what he thought was right, and to believe what he thought God meant? Well, this is what has been going on for thousands of years, and even today, it seems that no Christian group can reach consensus on what God requires of them. And this in spite of the fact that all the hard work has been done for them in the complete translation of the Bible and which is readily available for everyone. In fact, there are many translations of the Bible today, and there are significant differences in them all! So there are dozens of differing translations of the Bible! Are we all doomed because none of them agree on wording? If by some miracle the original handwritten scrolls of Moses could be found, would they be accurately translated by modern-day Christianity as a perfect record? I doubt it! Mainly because the original Hebrew language is now extinct. What we have today is a dialect of Hebrew. Similarly, the original language of English is also extinct, and today we use a greatly altered dialect of even the form of English in use in 1611 at the time of the translation of the King James Version of the Bible. There have been thousands of changes of archaic words and phrases in the KJV since its inception because of the changing dialect of the English language. And some of these changes, rather than clarify the meaning, have completely altered and obscured it. So who decides on the correct meaning of the Scriptures? The local parson? The Pope? Seventy-two Anglicans locked up in a room? The Church of God? Who? So to whom has God entrusted the meaning of the Scriptures? Well, the answer to this question is: God’s servants the prophets! It’s God’s servants who rightly divide the Word of Truth. These are God’s workmen, and it’s these who will complete the task. Even more importantly, who decides how and when God created the earth? Well, the answer to this is: God does! God makes known the beginning to the end, all that He has done, and all that He plans to do, and He reveals it to His servants the prophets. Some people become absolutely livid after reading the articles at our website, and some respond like maniacs. Many recognize that it is God’s Truth, but can’t accept it because it runs counter to all they have formerly believed. So they attack me personally, or try to find something that indicates a contradiction. Even if a word like ‘pendulum’ is misspelled, it becomes a major issue to these hypocrites. They’re like the religious hypocrites of Christ’s day, who wanted to kill Him because He spoke the Truth. They used any device available to them to launch an attack, and even resorted to lying to their teeth! What is so amusing about some of these hypocrites today is when you go to their website and read the rubbish they have written; misspelled words, contradictions, egotistical boasting, misquoted Scriptures all litter every page. You find nothing new that would indicate a scholarly approach to anything, and as for reflecting anything regarding a tangible, logical message – forget it! They distort everything God has said and attempt to indicate that God’s Plan is petty, and that He is only interested in an outward show of what men consider to be righteousness. No one can approach God except in absolute humility. God has no interest in uppity people. Similarly, no one enters God’s service except in humility. If they think they are indispensable to God then they quickly find they are not. And anyone who tries to strong-arm his way in, quickly finds they have no strength against the people of God, and neither are they welcomed. God sends His prophets to warn before important events, and when He does, He doesn’t make mistakes in His choice. He makes sure that the man He chooses performs according to His instructions. All the great prophets of God have a special ingredient embedded in them, usually at birth, which ensures this is so. This is God’s Holy Spirit. There is also another ingredient, and this is called the Counsellor, also called the Wisdom of God, and the Spirit of Truth, because it is the addition of the Spirit of God’s Son. John 14:15 "If you love me, you will obey what I command. And I will ask the Father, and He will give you another Counsellor to be with you forever – the Spirit of Truth. The world cannot accept Him (Jesus) because it neither sees Him or knows Him, for He lives with you and will be in you." V25 "All [that] I have spoken while still with you. But the Counsellor, the Holy Spirit, whom the Father will send in my Name, will teach you all things and will remind you of everything I have said to you. I do not give to you as the world gives." ‘As the world gives’ says it all! God gives the Spirit of Truth; the world gives the spirit of lies and deception. Deceivers ooze like slime from the woodwork when it comes to Truth. They haven’t been taught by God, and neither do they have the Testimony of Jesus, in fact, they don’t even know Jesus! Just ask a mainstream Christian to describe Him, and you will soon realize they know nothing about Him. Those who are led by the Spirit of God are the sons of God (Rom 8:14). Jesus said: John 6:44 "No-one can come to me unless the Father who sent me draws him, and I will raise him up at the last day. It is written in the prophets: They will all be taught by God. Everyone who listens to the Father and learns from Him comes to me." The prophet being quoted was Isaiah, and this is what Isaiah wrote: Isa 54:13 "All your sons will be taught by the LORD, and great will be your children’s peace." And this prophet just happens to be referring to the sons of Jerusalem – who indeed have children or offspring! (Rev 12:17). And their children will have great peace! Ps 116:15 "Precious in the sight of the LORD is the death of His saints." And in Isa 57:1-2 "The righteous perish, and no-one ponders it in his heart; devout men are taken away, and no-one understands that the righteous are taken away to be spared from evil. Those who walk uprightly enter into peace; they find rest as they lie in death." And as Jesus said in John 6:44 "I will raise him up at the last day." God is creating a family of sons and daughters who will be faithful to Him forever. In order to qualify for the rewards when they are handed out, each must prove themselves faithful to God just as His Son Jesus did. This requires them to search the Scriptures for information detailing what God requires of them. We all know that mainstream Christianity doesn’t do this! They leave it up to the local parson to determine it. God hasn’t called anyone to believe the local preacher – He’s called His servants to believe Him! If anyone doesn’t speak according to God’s Scriptures, then they have no Light of Dawn. You need the Light of God’s Holy Spirit to get through the long night and reach the light of dawn. Have you ever noticed how often people quote Isa 8:20 to accuse others? These preternaturals think it applies only to everyone else but themselves! They have no Truth, no Light of Dawn, they haven’t been taught by God, they don’t speak according to the Scriptures, and they live in the dark world of confusion. Isa 8:20 is their ‘proof-text’ and it never applies to them! This is what it says: Isa 8:20 "To the Law and the Testimony! If they do not speak according to this Word, they have no Light of Dawn. Distressed and hungry, they will roam through the land, when they are famished they will become enraged and, looking upward, will curse their king and their God. Then they will look towards the earth and see only darkness and gloom, and they will be thrust into utter darkness." The sons of God have been called to teach the Law and the Testimony of Jesus! It’s these two that are all-important! Do these other hypocrites even understand what this all-important Testimony is? It really doesn’t matter how cute they sound if they don’t speak according to this Testimony! And you’ll find they don’t! They only speak against it! They hate it because they have never understood it, and such people never will! As they become more and more enraged, they will start to curse their king and their God – and they will be thrust into utter darkness. Speaking of their king, Jesus spoke a parable of the king telling his servants to throw an ill-prepared man outside into utter darkness (Matt 22:13) and says many are invited, but few are chosen (V14). And in Matt 25:29 "For everyone who has will be given more, and he will have an abundance. Whoever does not have, even what he has will be taken away from him. And throw the worthless servant outside, into the darkness, where there will be weeping and gnashing of teeth." When those who reject the Testimony of Jesus are wandering around starving and seeing only fearful gloom, they will know they never ever had any Light of Dawn. And this all-important Testimony of Jesus is the Spirit of Prophecy (Rev 19:10), and this is what they don’t have! Like Satan the devil, they hate prophecy because prophecy condemns them. John 3:19 "This is THE VERDICT: Light has come into the world, but men loved darkness instead of light because their deeds were evil. Everyone who does evil hates the Light, and will not come into the Light for fear his deeds will be exposed. But whoever lives by the Truth comes into the Light, so that it may be seen plainly that what he has done has been done through God." Sadly, this Jewish writer decided on a ‘buck each way’ bet to placate Bible believers into accepting evolution. He begins by quoting Scripture, and confirms God instructed the man to replenish the earth. But as he progresses through the book, it becomes obvious that he means God was addressing a sub-human Neanderthal who was just learning to grunt. His point being that the fossil record shows that there were other creatures on earth before man. In reality, this man is an apologist for God. He believes in God, but doesn’t actually believe Him! THE VERDICT has now been given against all those who hate the Light and prefer darkness. THE VERDICT is against those who hate the Testimony of Jesus, and who hate the sons of God – the holy ones who have been taught by God Himself. THE VERDICT is irrevocable and God plans to deal swiftly and decisively with all who have stood against Him. The bringing of Light into the world was planned as a short work, but one which would end with speed and finality! And with the VERDICT comes the SENTENCE: Rom 9:28 "For the Lord will carry out His SENTENCE on earth with speed and finality." Jesus brought the Light into the world with a short work – just 3½ years. Jesus is the Light of the world – and the Bright Morning Star. John 8:12 "When Jesus spoke again to the people, He said, "I am the Light of the world. Whoever follows me will never walk in darkness, but will have the Light of life." The Pharisees challenged Him (as usual), "Here you are, appearing as your own witness; your Testimony is not valid." (How typical! But it was the only accusation they could think of on the spur of the moment!) Leaving aside the accusations of fools, Jesus also stated something else concerning the Light of the world: John 9:4-5 "As long as it is day, we must do the Work of Him who sent me. Night is coming, when no-one can work. WHILE I am in the world, I am the Light of the world." While Jesus was in the world, He was that Light. And in Matt 5:11-12 "Blessed are you when people insult you, persecute you and falsely say all kinds of evil against you because of me. Rejoice and be glad, because great is your reward in heaven, for in the same way they persecuted the prophets who were before you." V14 "YOU are the LIGHT OF THE WORLD." When Jesus departed, the Light continued through His disciples and they became the Light of the world. Immediately, the dark forces of evil set out to persecute Christians. Satan’s agents remained hard at work for 40 years until God brought them to a swift end in 70 AD with sudden destruction and slaughter after they burned down the Temple. It’s a sad fact that the Jewish leaders persecuted Christianity all over the Mediterranean region. Then Christianity persecuted them for centuries, but neither possessed the Light of the world. These dark, evil creatures – these invisible rulers of the heavenly realms – hate the Light and the Truth! They see themselves as being exempt from the Law and the Testimony, and they certainly don’t speak according to it! They only speak against it! But the verdict has already been given, and they are condemned. There are precious few who are chosen, and those who have been rejected face a harrowing time. And nothing now will save them! They will learn the hard way the distinction between those who serve God and those who don’t (Mal 3:18). 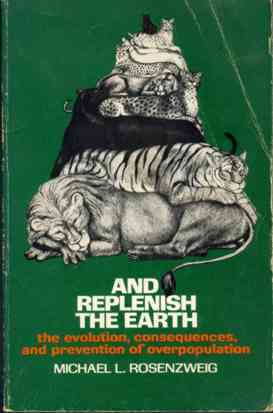 So did God instruct Adam to replenish the earth, or re-fill it, or did He say to fill it full? Of course, if you want to insist that God didn’t replenish the earth, then you are falling into the trap of denying the evidence of the things that are already made – a point made by the Apostle Paul (Rom 1:20). Among the things that were made are the dinosaurs, and the dinosaurs filled the whole earth! Only a complete fool would deny the evidence of the reptilian world of the dinosaurs. Many of the remains of these are encased in hard sandstones, slates and dolomites. It’s convenient for those who like to argue against the evidence to claim all these fossils are in pyroclastics of volcanic origins, but it’s just not so. Some of them are in greatly deformed beds of limestone, alternating with slates, dolomites, mudstones, sandstones, sediments of marine rather than volcanic origins, and some of these beds have been upturned to a vertical position. 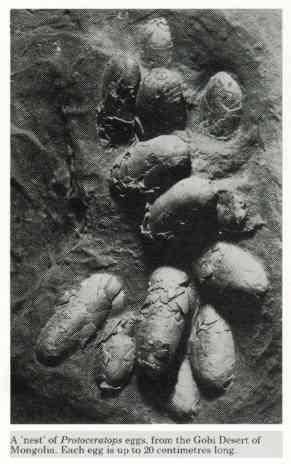 Dinosaur eggs cased in rock. From the Gobi Desert of Mongolia. One of the reasons that this creation is called reptilian is because they produced their young through eggs rather than being born as living creatures. Considering the number of fossil eggs that have been found of different sizes, it would seem to have been universal among all these creatures. Something that you will notice in the Bible is that God uses ‘seed’ rather than ‘eggs’ in describing offspring relating to this creation. If you take the time to think about it, then you’ll understand why. Fossilized Dinosaur. 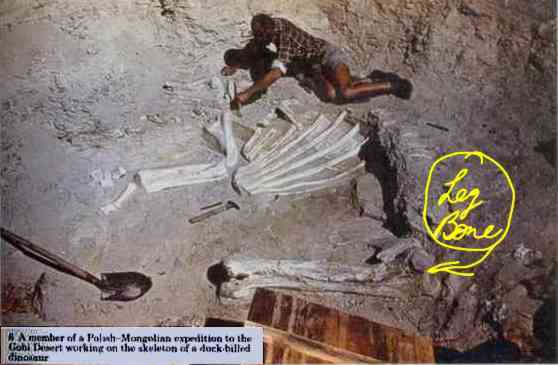 In the Gobi desert an archeologists chips away at the stone to extract the remains of a giant dinosaur. Note the upper leg-bone in the foreground. It’s the size of a man. 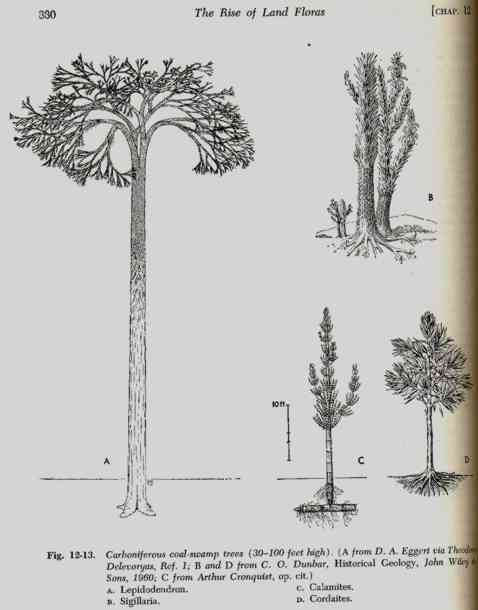 Examples of flora found in Coal seams. These flora are unlike any existing flora on earth and have been classified as being unique to coal deposits in fossil form. The evidence of coal bedding is even more spectacular. Whole carbonized trees have been found extending through multiple layers of coal and the intervening rock layers, showing that rather than a gradual successive bedding over eons of time, these formations were laid down en masse – at the same time! We even have examples of coal beds being overlain with granites and ironstone which defeats the ideas of the theorists with claims of an organized procession of strata formation. They have even developed phraseology that glosses over the unexplainable, and call it ‘non-conformity’ or ‘unconformity’. Well, there is no such thing as non-conformity! Everything conforms with Truth! It’s foolish theories that are non-conformist. Unwilling to accept the evidence, many creationists have spoken of local phenomena that has occurred during mankind’s tenure on earth as resulting in what we see. But when we view the prolific number of coalfields around the world, we know that these were not localized events. Furthermore, the fossil record of the carbonized vegetation found in these coal beds does not match the vegetation common to this era. But let’s not be too hard on the creationists, who at least had a noble purpose for their distortion of the record. It’s the evolutionists who have no grounds for justification of their ideas; and it’s these who are the greater fools. Prehistoric flora. 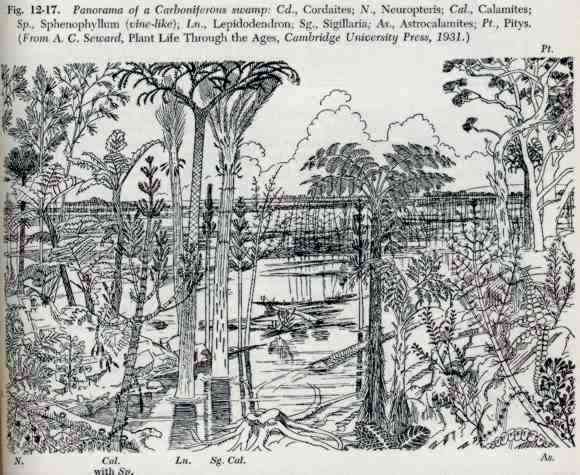 An artist’s attempt to recreate a plethora of extinct plants in a swamp-like setting. All of these represent species found in coal-bedded fossilized flora. They may well have existed in swamps, but the end product which was produced in coal was not produced in this setting. Those who classify themselves as ‘earth scientists’ today, are not scientists at all in the sense of the word. In fact, God calls them fools. In most endeavours, people manage to get some things right, but the presumptions of all earth scientists has been consistently wrong. In the matter of coal deposits, even a school student can understand that the carbonized structure of coal required heat in order to be formed. Not so, say the earth scientists, it was formed in swampy water. The problem is that most coal deposits don’t conform to their expectations of how they were formed. For instance, most coal beds are not in level strata, and neither are they loosely laid down, but rather compacted under enormous pressure and always in the presence of strata showing signs of great heat. Rather than swamp-like conditions, coal was subjected to greatly elevated heat and pressures. Even today, we know that to extract carbon from living things, we must subject them to heat. Trees in particular are readily reduced to carbon by burning. No-one would suggest that coal is made from anything but vegetation and tree flora, but the prevailing theories don’t link this reality with the evidence. When carbon is subjected to greatly elevated extremes heat and pressures it will crystallize into diamonds. No-one would suggest that diamonds could be made from a cellulose tree without the intermediary stage of converting it to carbon first. Even then, a perfect diamond requires a perfect matrix of carbon prior to crystallization. In fact, diamonds were not produced from trees anyway. Petrified tree stumps. 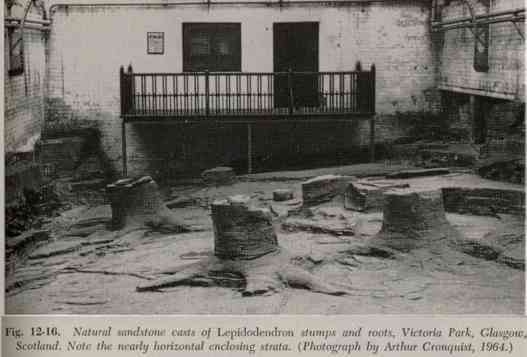 Here we have an example of ancient tree stumps replaced and cast in petrifaction into a bedding of fused sandstone. 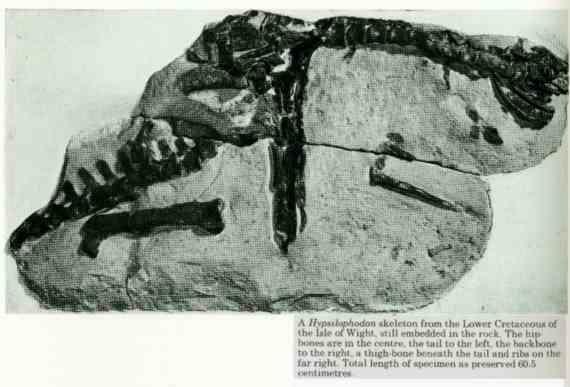 There are too many examples of fossilization to refute the Bible evidence of lifeforms prior to the re-creation of the Adamic forms of life we know today. Peculiarly, the evidence of all this doesn’t refute the evidence of the Bible as some seem to imagine. God has not hidden the Bible evidence of His creation, men have! Worse than this, we have stupid, self-proclaimed ‘intellectuals’ who try to refute what God has said. Then we have the religious people who defend a foolish position because they don’t understand what God has said. It’s difficult to decide who is worse, those who deny the evidence or those who are too stupid to understand it. The fact remains that there is plenty of evidence of a former creation. The fossil record supports it, and God’s Word acknowledges it. Those who take the first few verses in the Bible and proof-text it to their own views proves what they are. They don’t seek God’s Truth based on the principle of precept upon precept, line upon line, etc. They openly challenge God in ridicule, and are incapable of understanding some very elementary things. If they were right, then this would indicate that God is totally confused in saying that day and night were made in Gen 1:3, when, as some have foolishly assumed, He hadn’t yet made the sun. Implying that God is a fool doesn’t worry them, as long as everyone else thinks they’re smart. They don’t stand in awe of God and tremble at His Word – they heap ridicule and hope that others will believe them – and follow them. Isa 66:2 "Has not my hand made all these things, and so they came into being?" declares the LORD. "This is the one I esteem: he who is humble and contrite in spirit, and trembles at my Word." There can be no doubt about what the Creator God is speaking of here! You could write a thick book on the contents of Isa 66, but let’s be selective concerning the timeframe mentioned here: V15 "See, the LORD is coming with fire, and His chariots are like a whirlwind; He will bring down His anger with fury, and His rebuke with flames of fire. For with fire and with His sword the LORD will execute judgment upon all men, and many will be slain by the LORD." You might like to guess who will be in those chariots. You don’t really have to guess, because the Scriptures tell us! Solid rock embedded with fossils. Careful chipping was needed to expose this dinosaur fossil. This creature was unlike any other on earth today. But God makes it clear that He has no interest in those who don’t believe Him – only in those who do! Those who treat Him with contempt will not escape His fury, and particularly those who teach others to do the same. In the same chapter of Isaiah God warns those who follow others in their evil in these terms: V17 "Those who consecrate and purify themselves to go into gardens, following the one in the midst of those who eat the flesh of pigs and rats and other abominable things – they will meet their end together." If you start following one who is teaching perversion of God’s Word, then you will die with them. Such people will not only die but will be excluded from any reward. God will gather others instead: V18 "And I, because of their actions and imaginations, am about to come and gather all nations and tongues, and they will come and see my glory." And hasn’t God made provisions for all nations and tongues that turn and faithfully obey Him? (Rev 7:9). What the House of Israel is reluctant to do – others will do! God warned of this in Eze 3:5 "You are not being sent to a people of obscure speech and difficult language, whose words you cannot understand. Surely if I had sent you to them, they would have listened to you. But the House of Israel is not willing to listen to you because they are not willing to listen to me, for the whole House of Israel is hardened and obstinate." This gives you an idea of just how privileged the House of Israel is! If God were to sent His servants to foreigners of difficult speech they would have listened. But not the House of Israel! But God servants are not being sent to Gentiles in this endtime as God clearly told Ezekiel. They are being sent to the House of Israel. But the time will come when many Gentiles will hear God’s Truth and accept it with joy and faithfully serve Him. The Star of David will no longer be a horror and a curse to the world, but a blessing, and a sign and a symbol to all nations. Those who hated it will be dead. It was through David’s famous Son Jesus that this symbol has been preserved as the Cornerstone and the symbol of the earth. You can scour the entire earth for an explanation of the meaning of the Star of David, and you won’t find it. Satan and his Moslem hordes realized that it had significance, but didn’t know what that significance was. They adopted a variation in the form of a five-pointed star, and tried to suggest that the five-pointed star was the star of Solomon, who considered himself to be less than equal to his father. 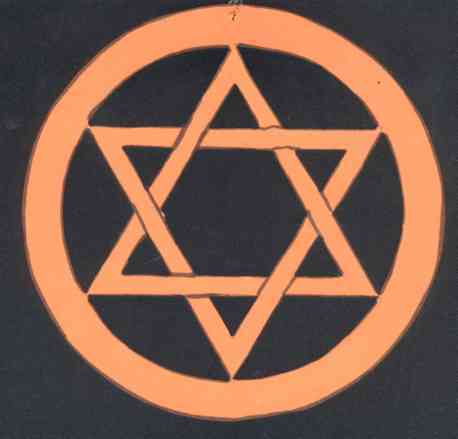 In modern-day Babylon (Iraq), they have adopted an eight-pointed star in order to feel superior to the Jews. What all Islam hates are six-pointed stars. They have no idea of the meaning of it, but they despise it. The Star of David is really two pyramids interlocked within a circle. Credit: Produced by one of this Brotherhood’s precious little children in New Zealand along with some other precious gifts. Since the time of David, the symbol has been preserved – not as a star, but as two pyramids interlocked together and enclosed in a circle. It’s unfortunate that the Jewish people did not retain the circle in their national emblem because it’s a sign and symbol of what is to come. On the entire face of the earth, only this Brotherhood has understood it’s meaning. God reveals His secrets and His Great Plan only to His servants the prophets. Most people have no real interest in the things that are important to God, but only in the things that are important to them. Consequently, they ignore everything to do with the history of this earth, and all prophecy concerning things to come, in favour of emotional rhetoric. They are not averse, however, to muttering their own prophecies, provided it casts them in a good light, and brings them admiration for their efforts. But this type of behaviour could hardly be considered Godliness. Moslem pentagram. 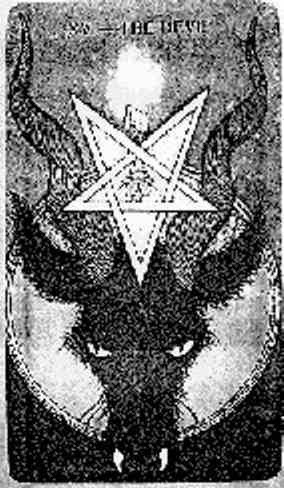 It’s not known where this old drawing came from but it features the interlocking five-pointed star – the counterfeit of the Star of David. It was the trademark of Egyptian sorcerers and gypsies in the Dark Age who openly worshipped the devil. It’s worth noting that the Lord is coming with thousands upon thousands of His holy ones to convict the godless just as Isaiah said, as well as Samuel, David, Habakkuk and others, and just as Jude mentioned in Jude 1:14 that refers to something Enoch, the seventh from Adam said concerning thousands of God’s saints. This is what it says: Jude 1:14 "Enoch, the seventh from Adam, prophesied about these men: "See, the Lord is coming with thousands upon thousands of His holy ones (saints) to judge everyone, and to convict all the ungodly of all the ungodly acts they have done in the ungodly way, and of all the harsh words that ungodly sinners have spoken against Him." We have no direct evidence that Enoch said this, but Moses certainly did in Deut 33:2. Jude was speaking of a future time when the Lord would appear with myriads of His saints. Moses also spoke of the LORD appearing with thousands upon thousands of His holy ones. This was immediately after he delivered the Song of Moses in Deut 32. In the Song of Moses it says this: Deut 32:40-43 "I lift my hand to heaven and declare: ‘As surely as I live forever, when I sharpen my flashing sword and my hand grasps it in judgment, I will take vengeance on my adversaries and repay those who hate me. I will make my arrows drunk with blood, while my sword devours flesh; the blood of the slain and the captives, the heads of the enemy leaders.’ Rejoice, O nations, with His people, for He will avenge the blood of His servants; He will take vengeance on his enemies and make atonement for His land and people." And in Deut 33:2 "The LORD came from Sinai and DAWNED OVER THEM from Seir: He shone forth from Mount Paran. HE CAME WITH MYRIADS OF HIS HOLY ONES from the south, from His mountain slopes. Surely it is you who love the people; all the holy ones are in your hand. At your feet they all bow down, and from you they receive instruction, the Law that Moses gave us, the [treasured – Mal 3:17] possession of the assembly of Jacob." This is precisely what the prophet Habakkuk was speaking about in Hab 3:3-4 and how His splendour was like the sunrise – the dawning. Hab 3:11 "Sun and moon stood still in the heavens at the glint of your flying arrows, at the lightning of your flashing spear (should be sword – Ps 7:13). In wrath you strode through the earth and in anger you threshed the nations. You came out to deliver your people, to save your anointed one. You crushed the leader of the land of wickedness, you stripped him from head to foot (and left him NAKED). With your own spear (probably sword – Isa 27:1) you pierced his head when his warriors stormed out to scatter us, gloating as though about to devour the wretched who were in hiding. You trampled the sea with your horses, CHURNING THE GREAT WATERS." Job spoke of it in Job 26:6 "Death is NAKED before God; Destruction lies uncovered." V12 "By His power HE CHURNED UP THE SEA; by His Wisdom he cut Rahab (epithet for the harlot) to pieces. By His breath the skies became fair; HIS HAND PIERCED THE GLIDING DRAGON." And with this act, a whole new order of things will emerge (Heb 9:10), and there will be sustainable peace for almost a thousand years – until Satan is released from prison once more. But that’s another story. The Book of Hebrews speaks of THE TIME OF THE NEW ORDER (Heb 9:10). It may be just fortuitous that Ephraim (U.S.) also speaks of a NEW ORDER OF THE AGES.